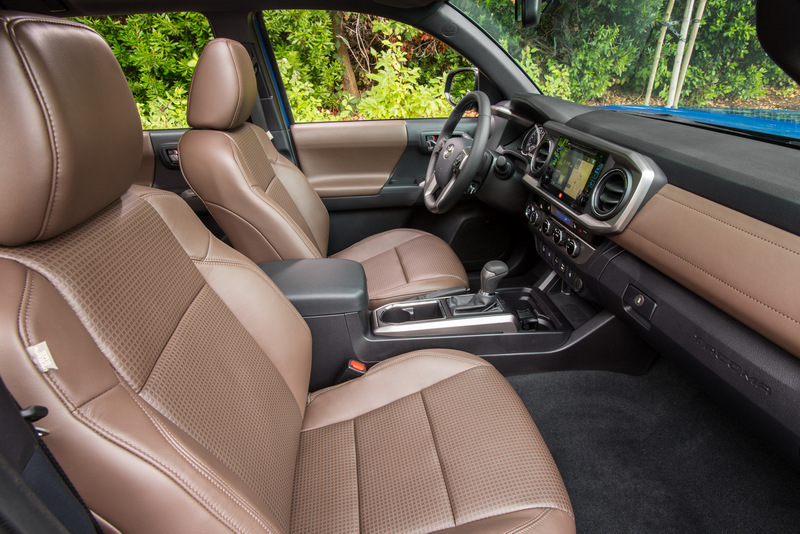 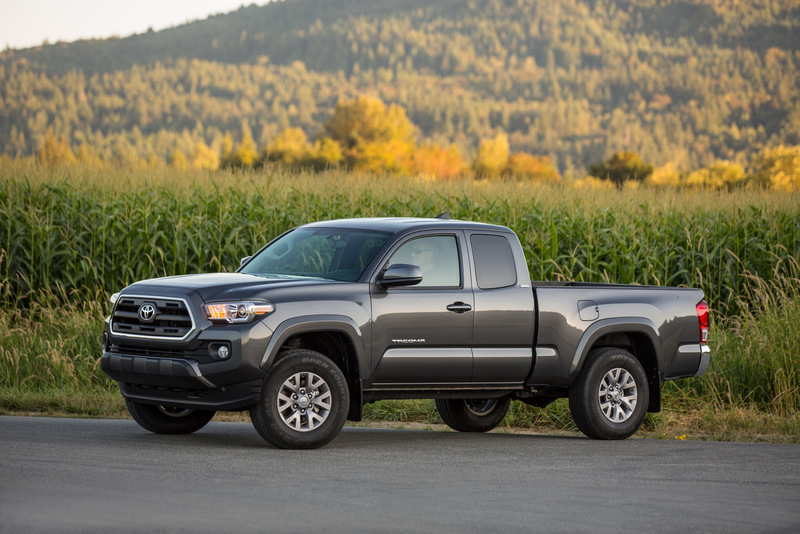 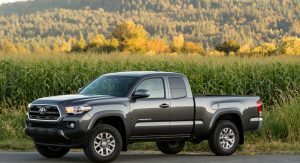 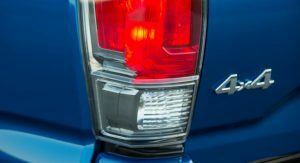 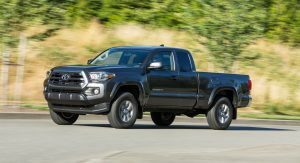 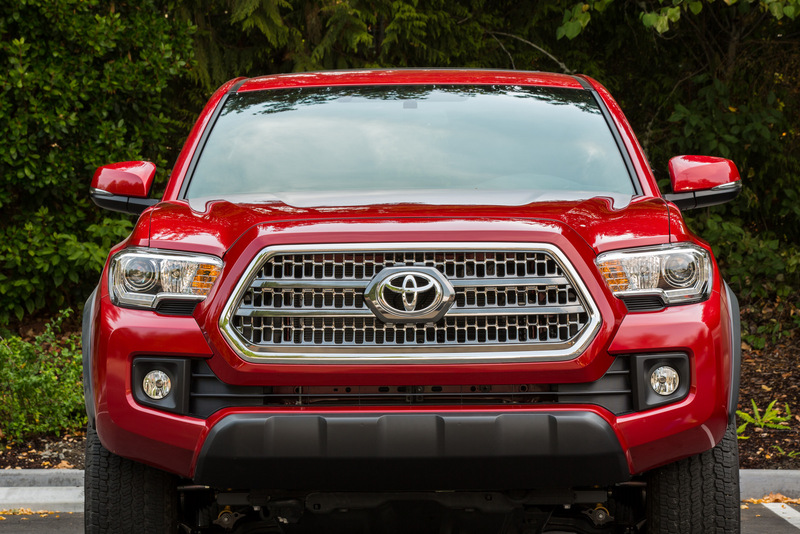 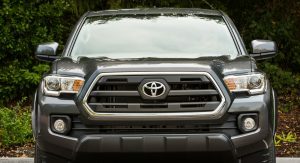 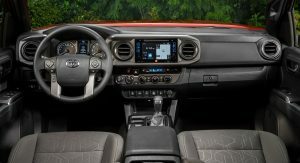 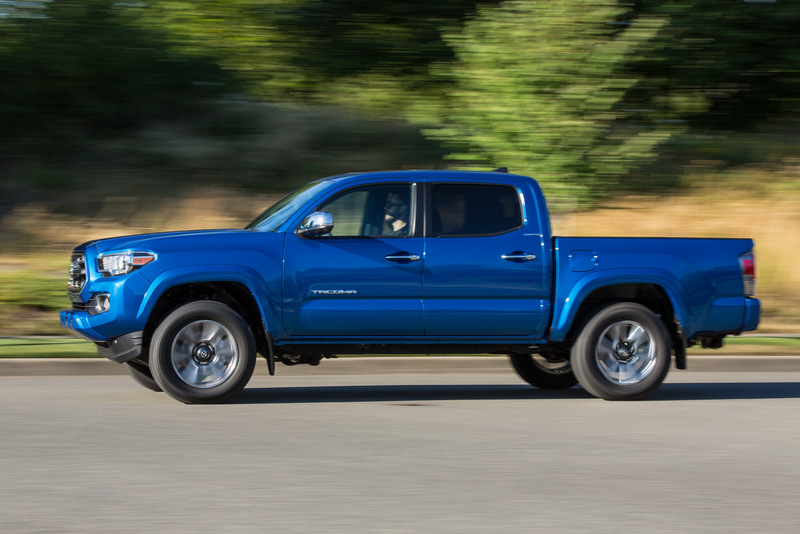 Toyota has released pricing information and fuel economy ratings for the 2016 Tacoma mid-size pickup truck. 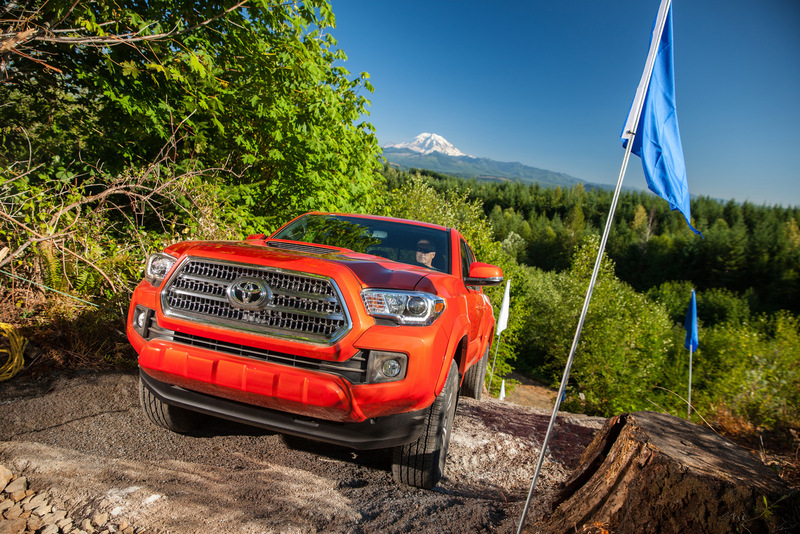 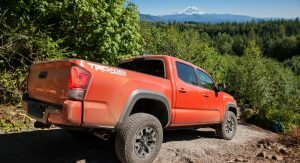 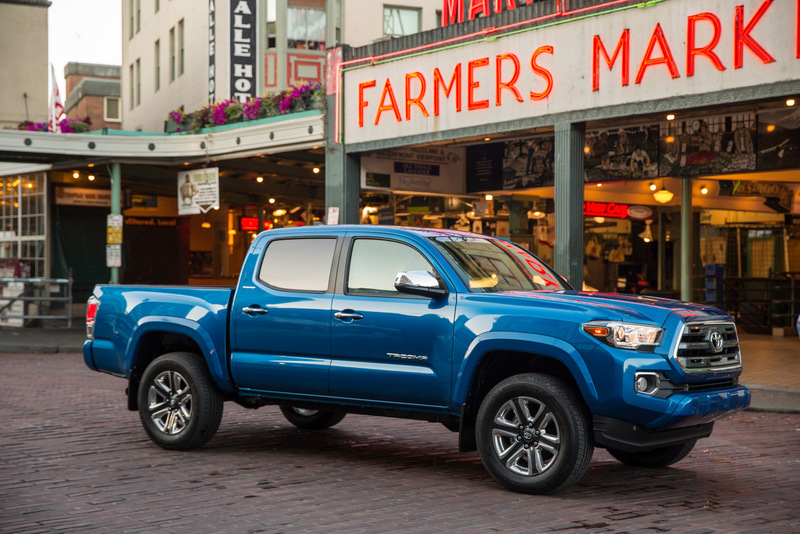 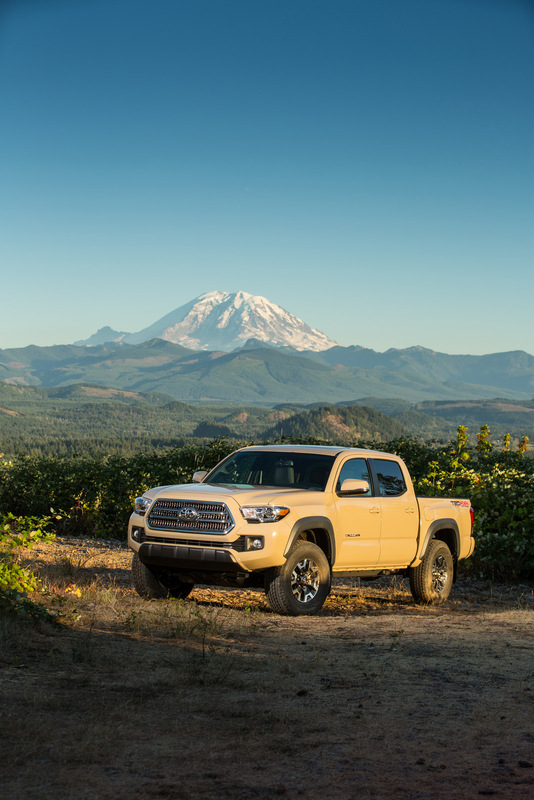 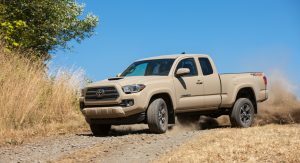 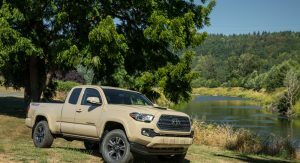 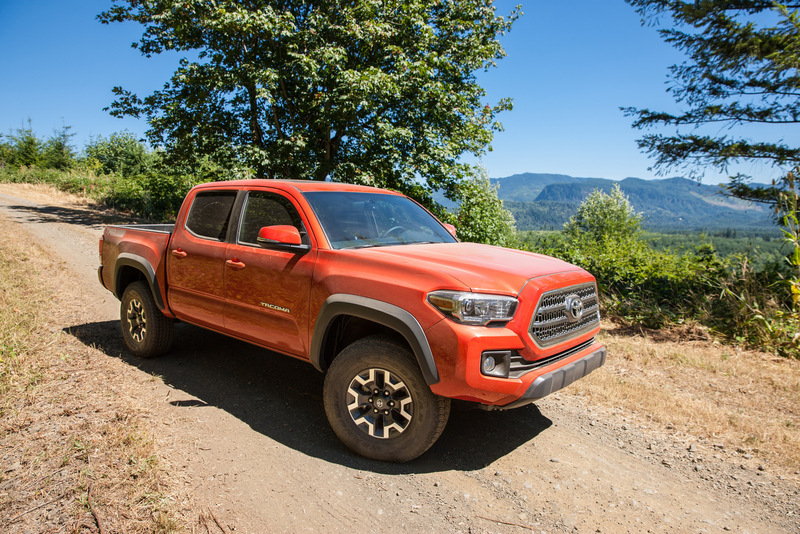 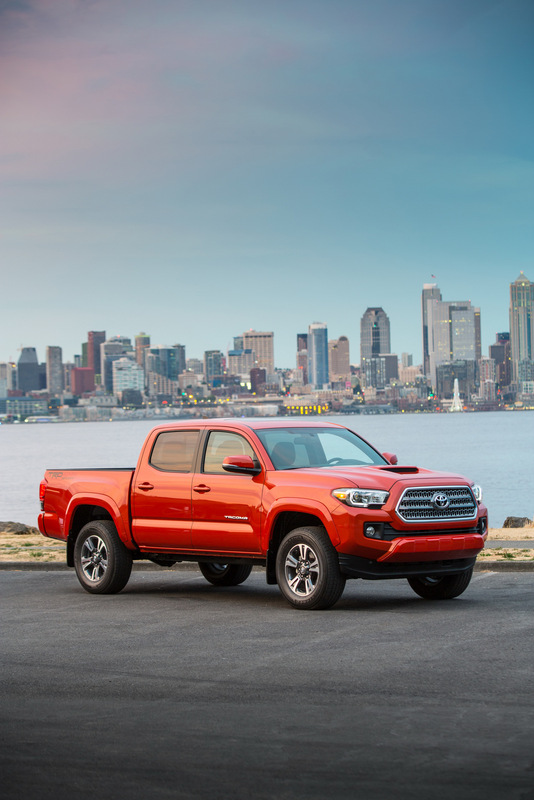 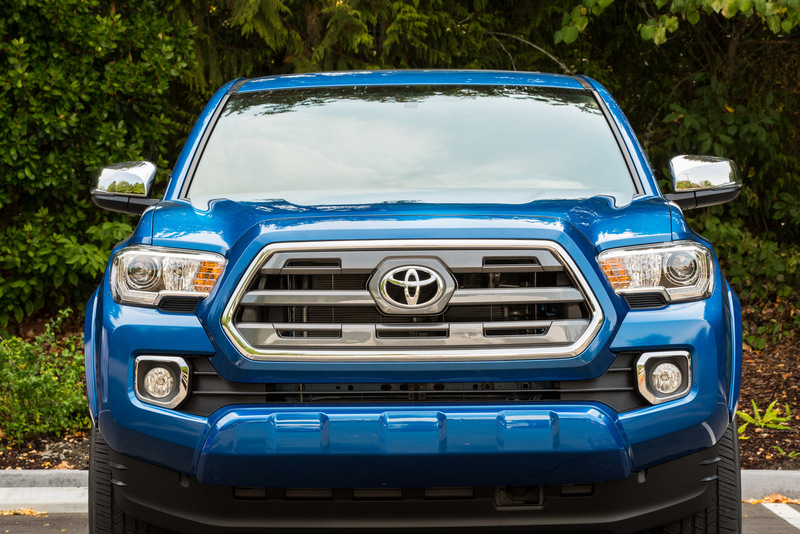 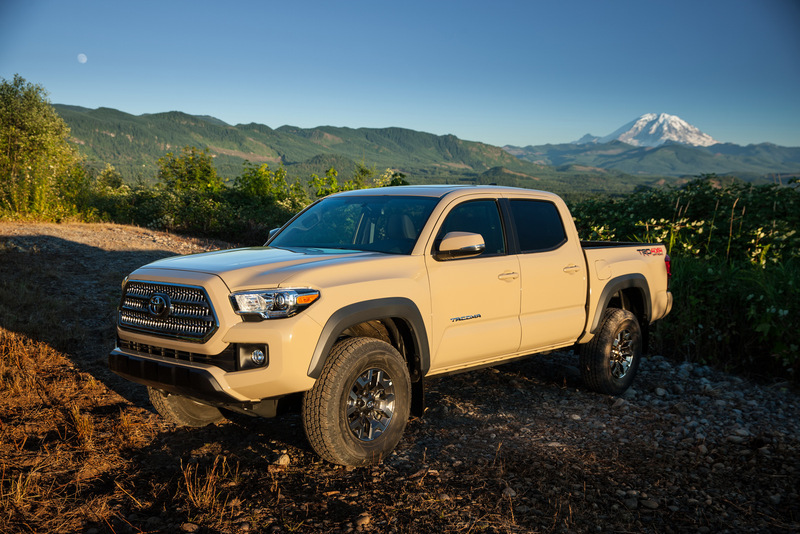 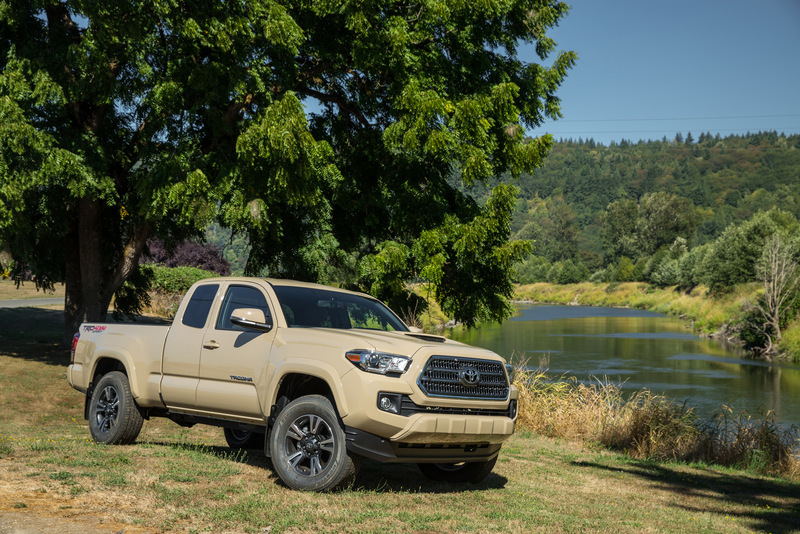 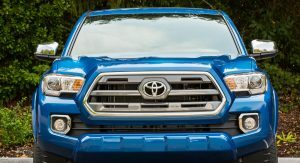 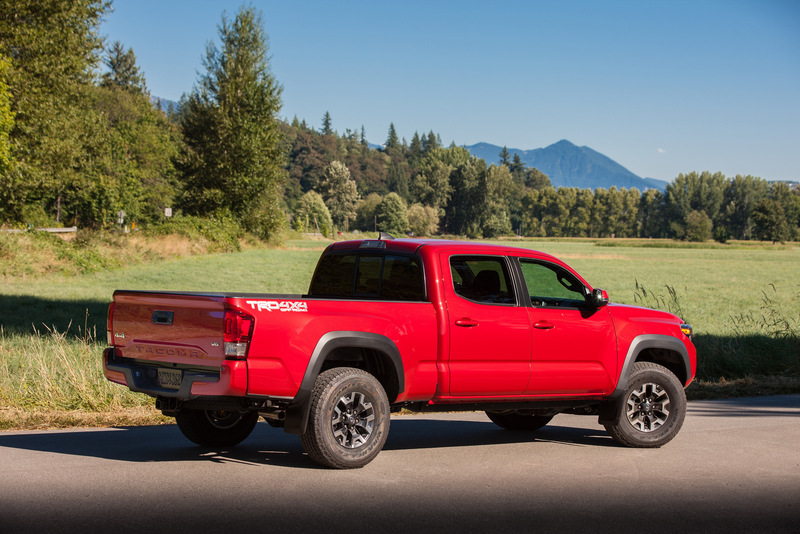 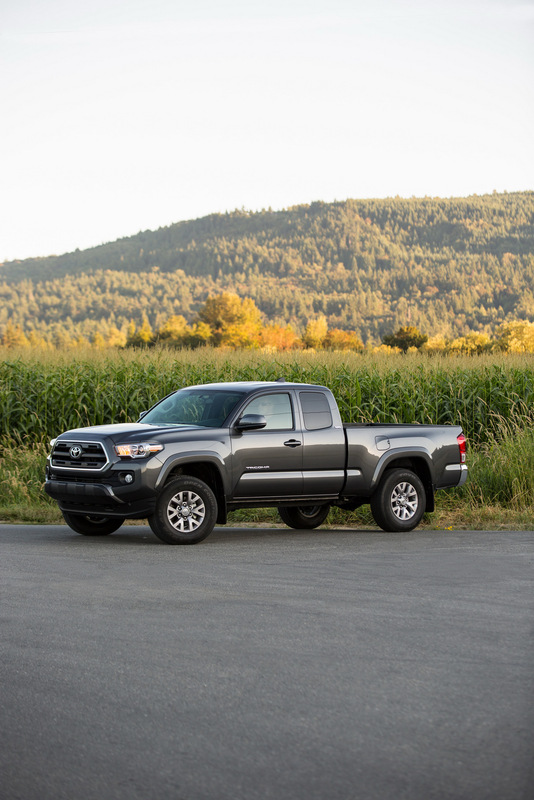 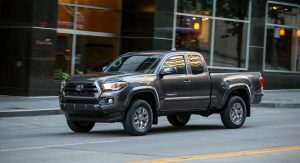 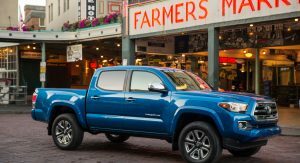 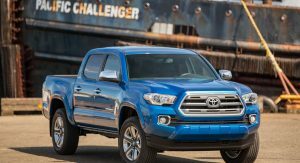 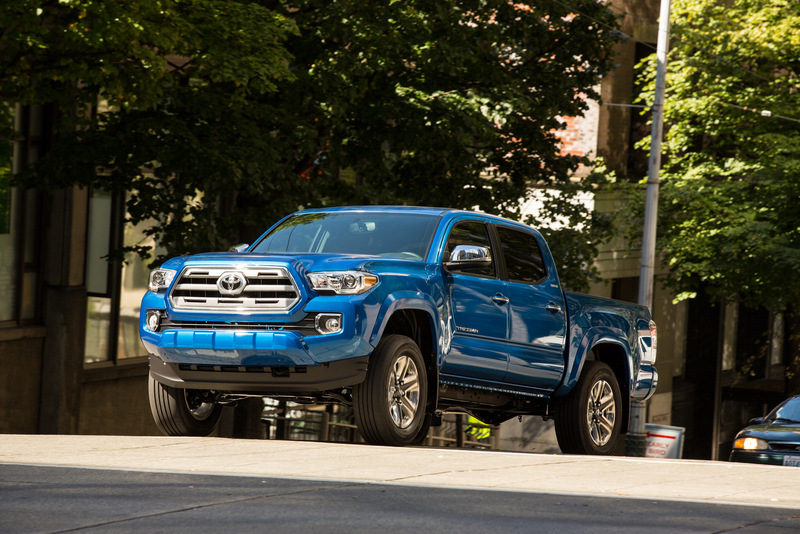 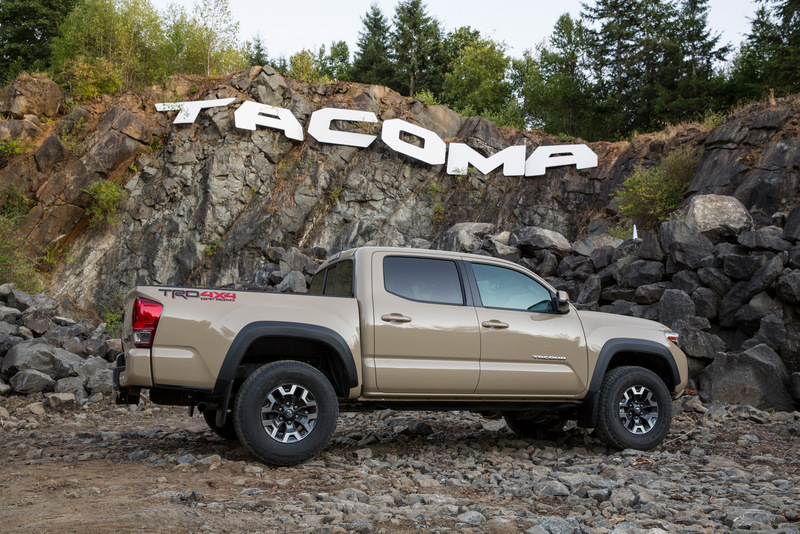 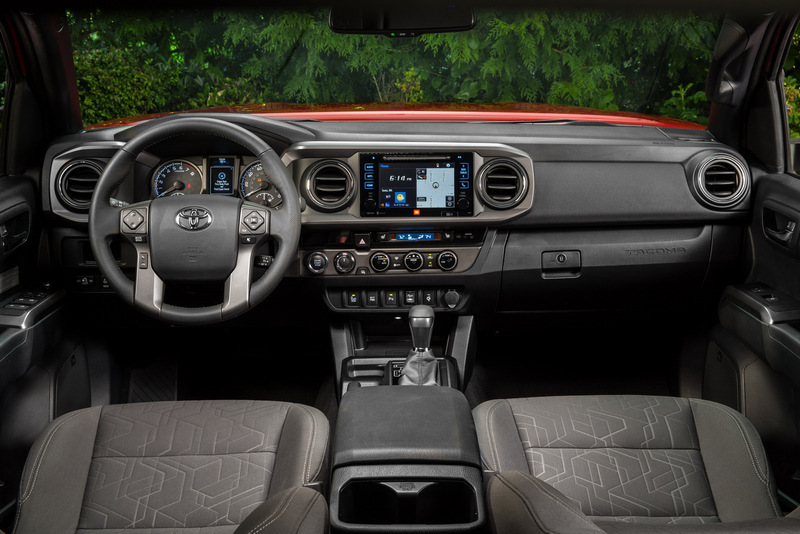 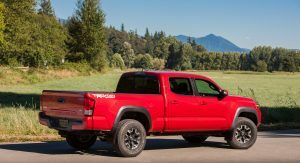 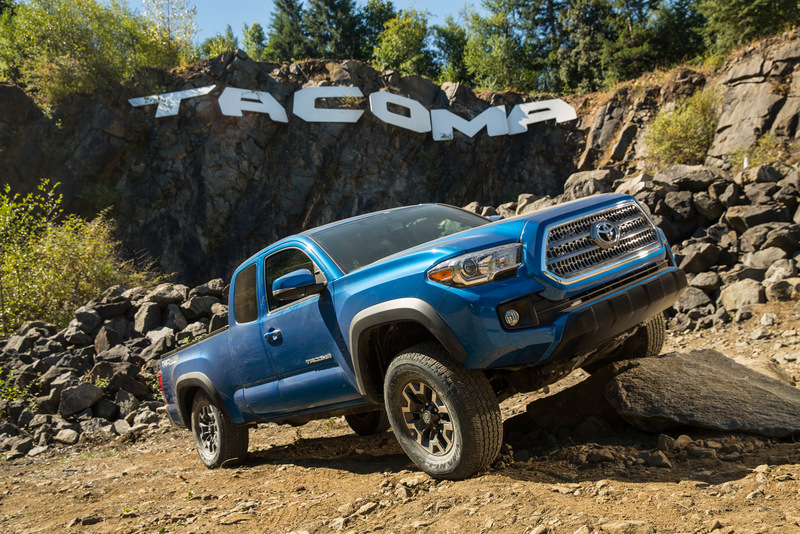 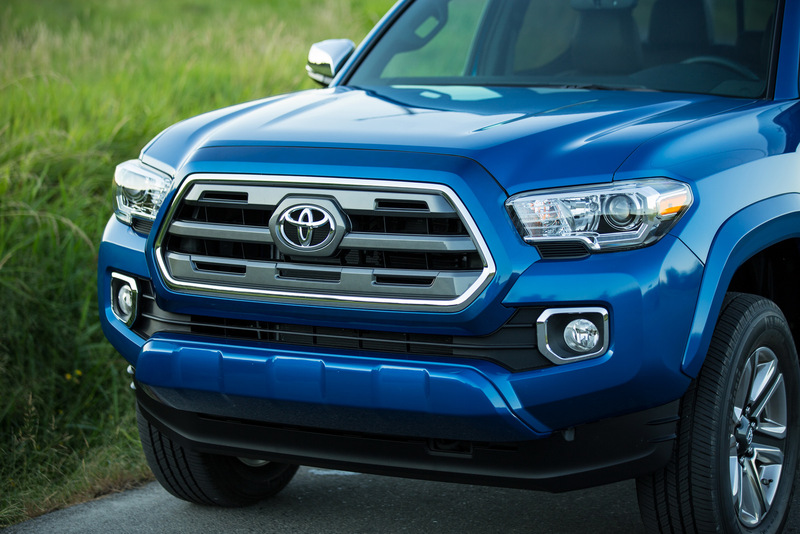 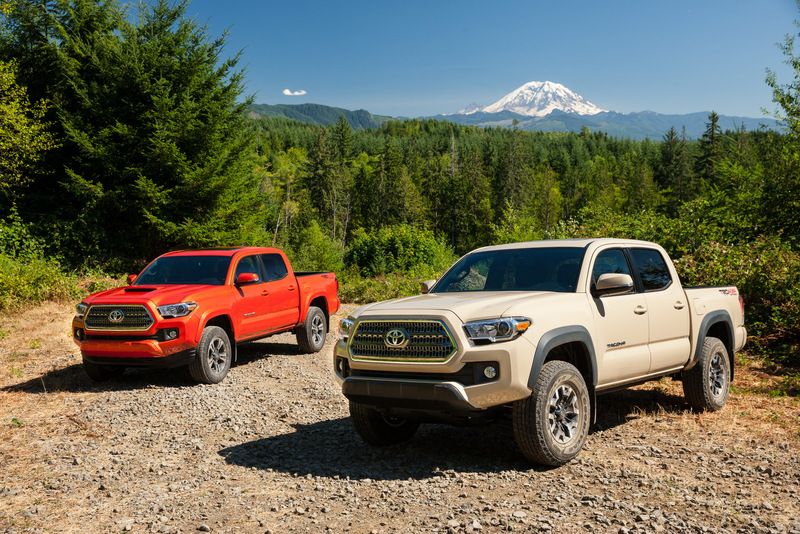 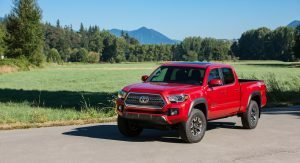 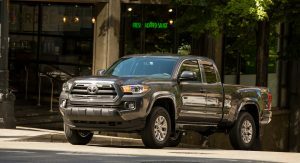 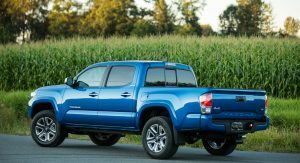 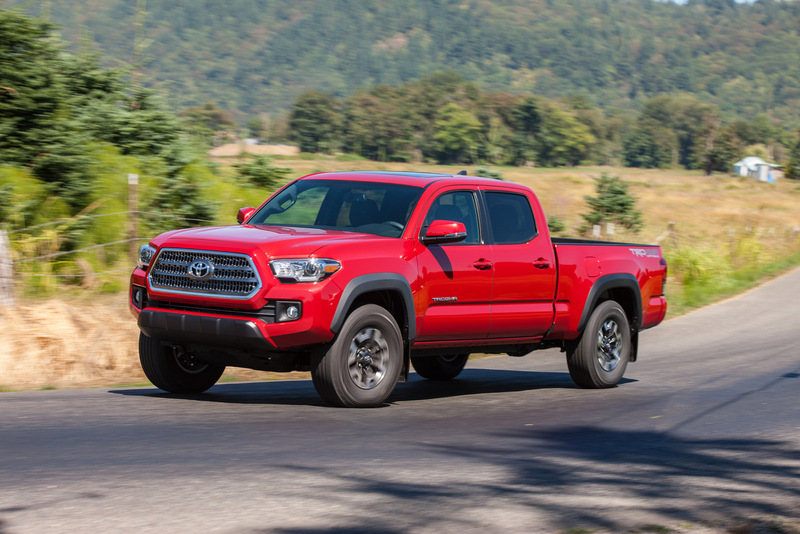 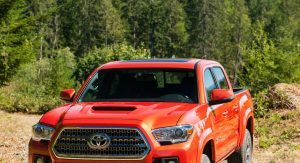 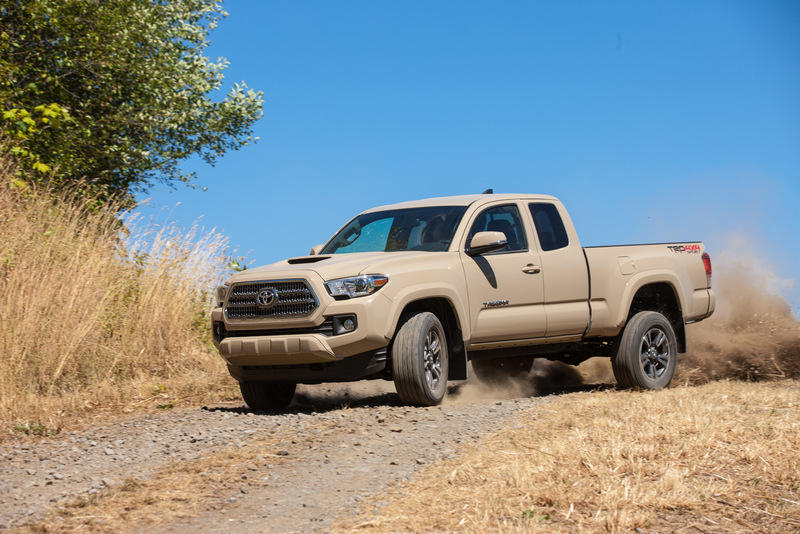 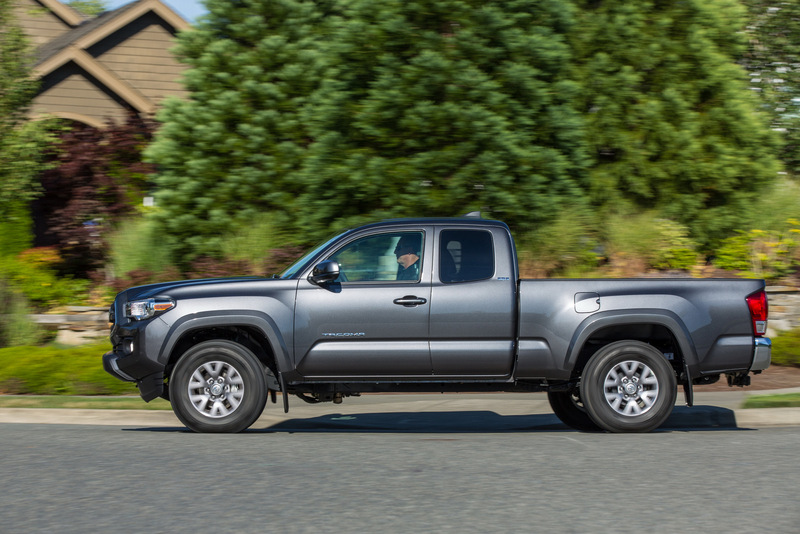 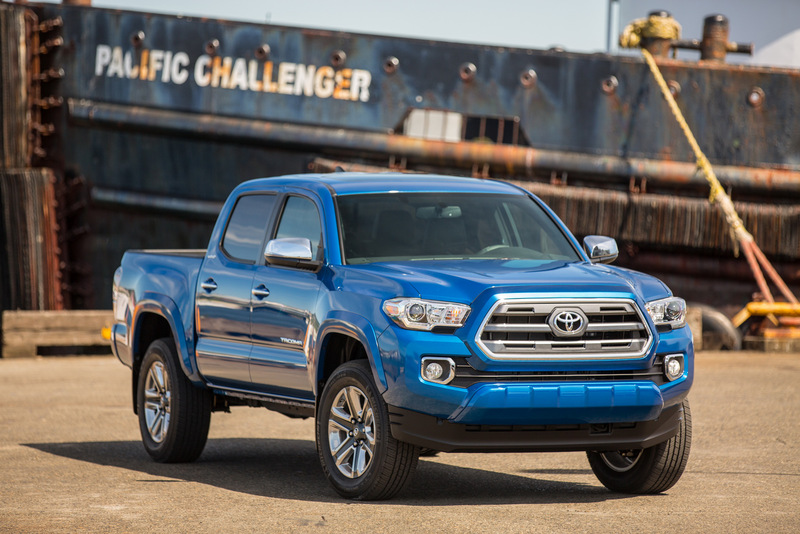 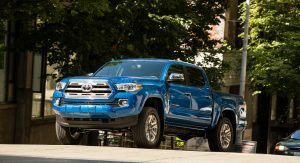 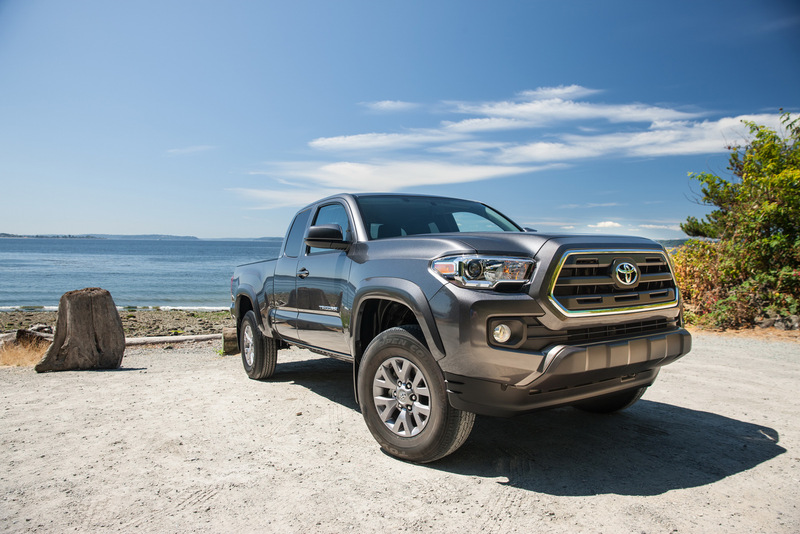 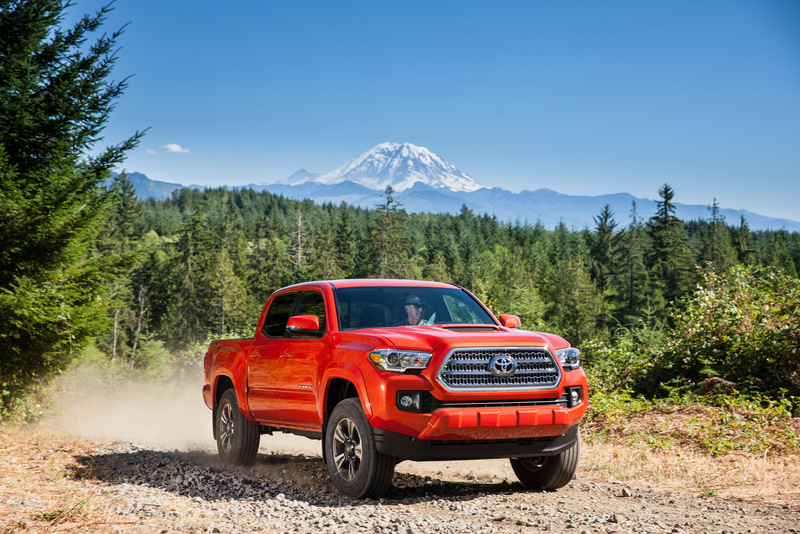 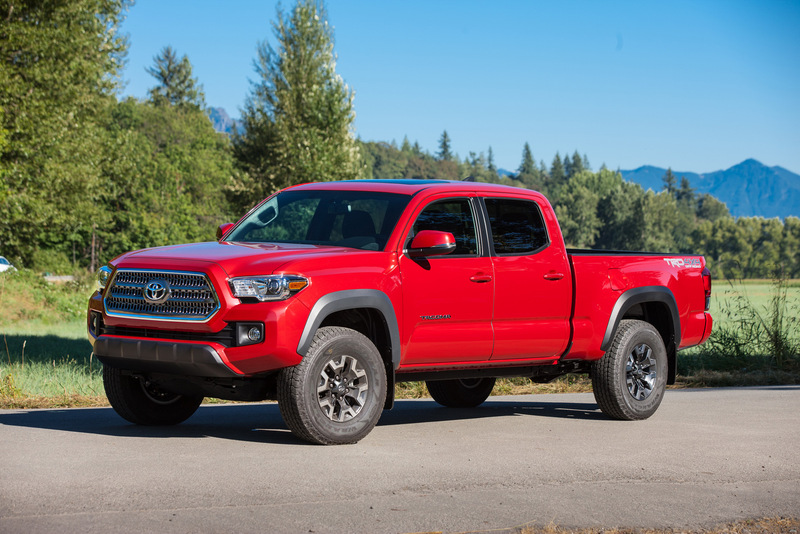 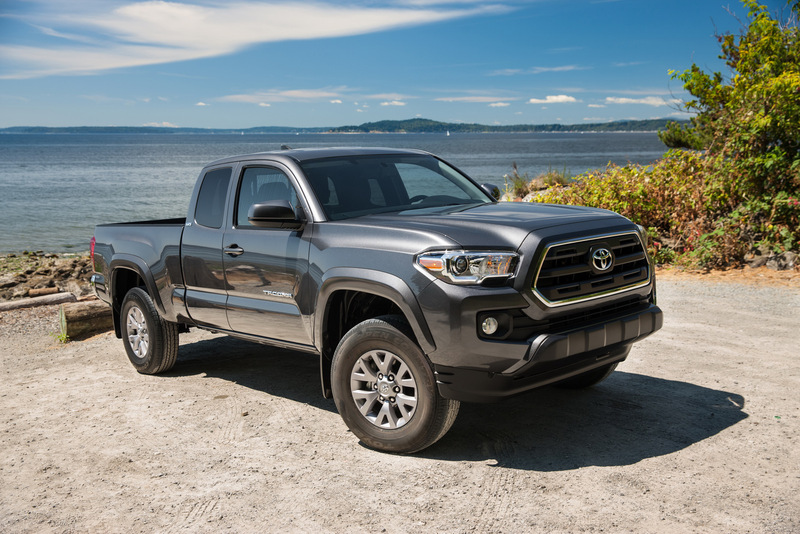 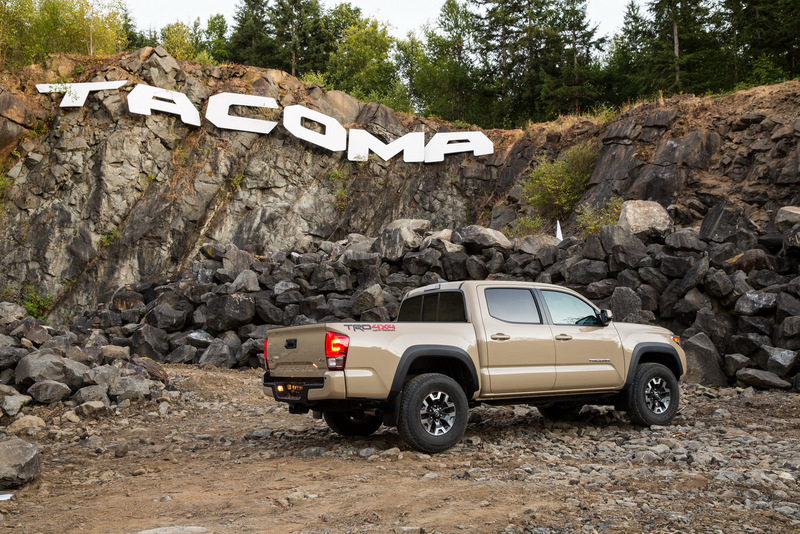 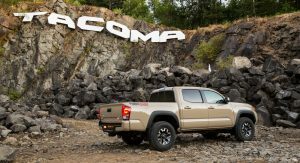 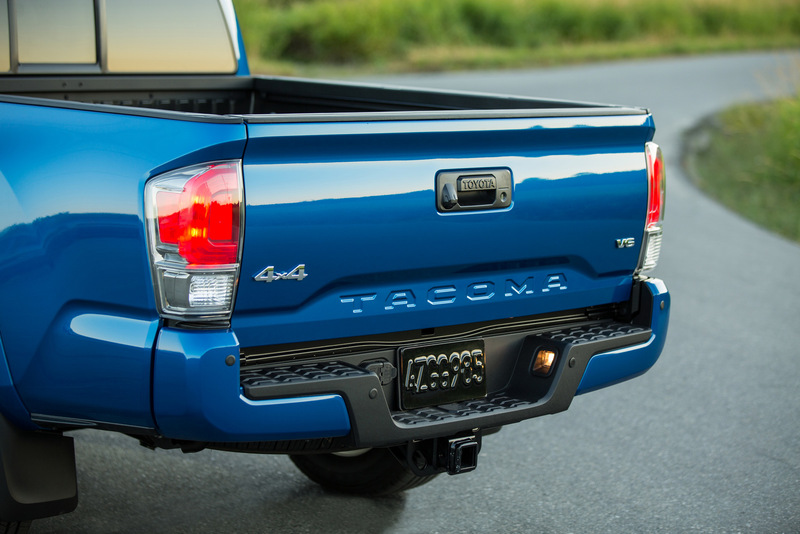 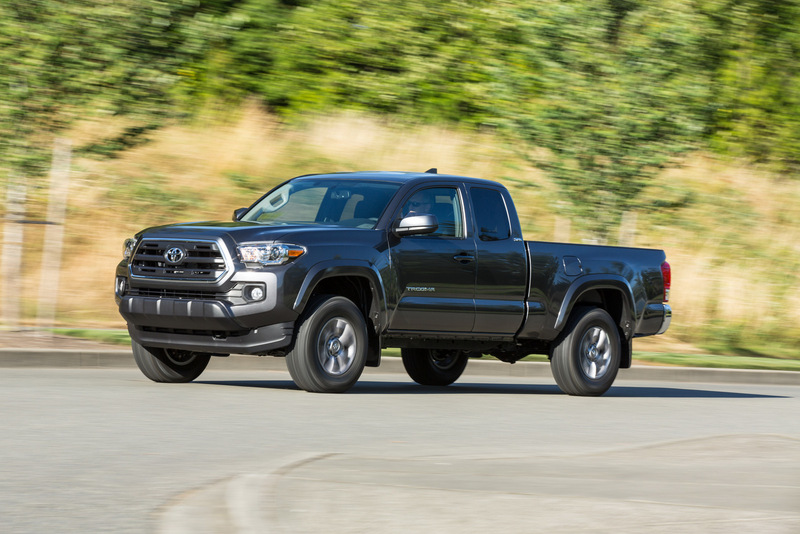 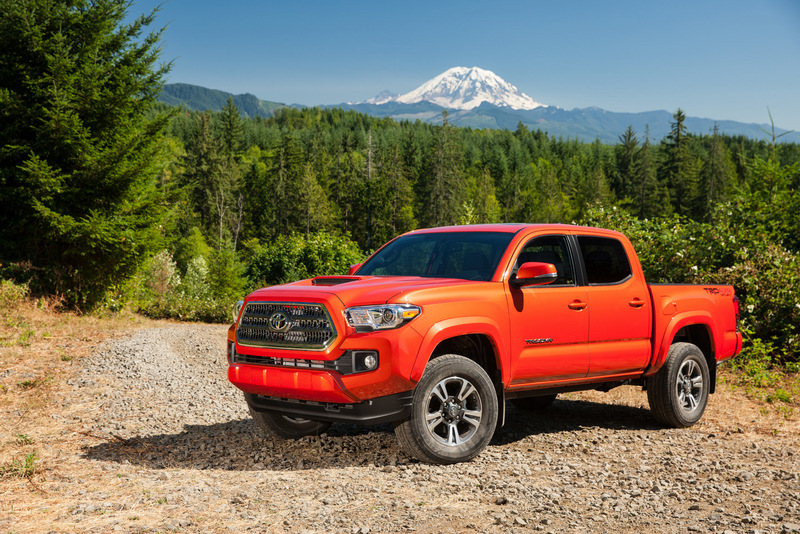 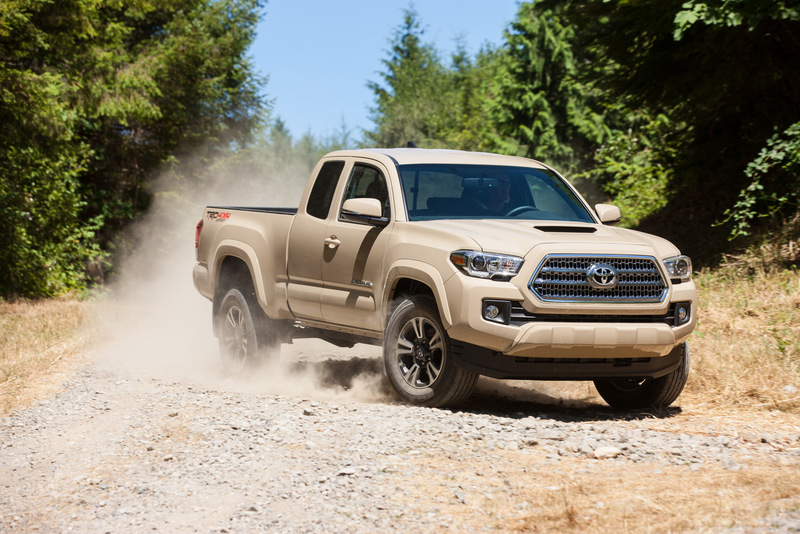 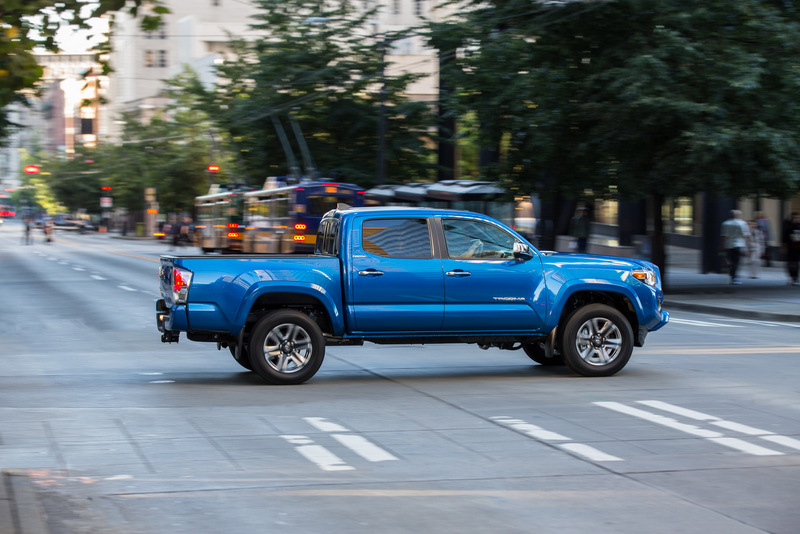 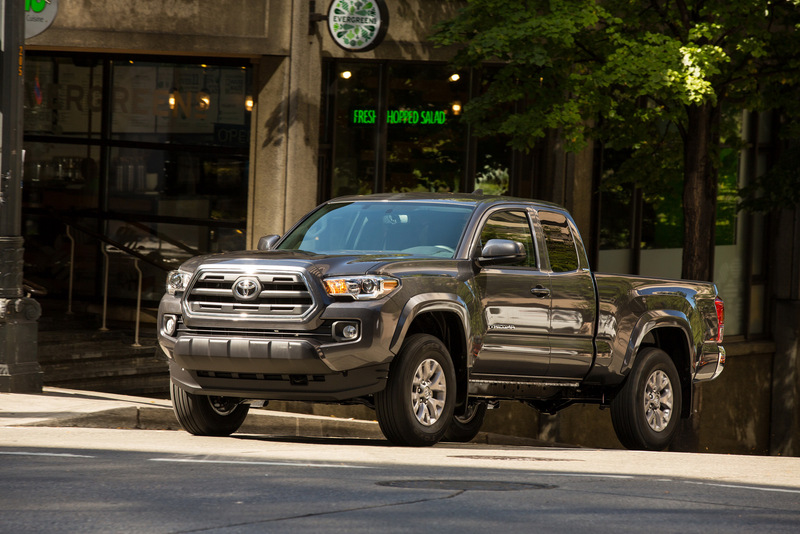 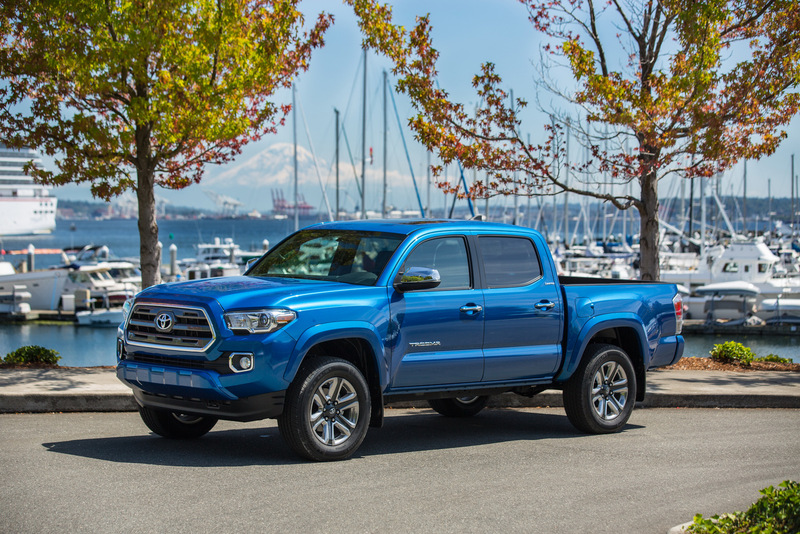 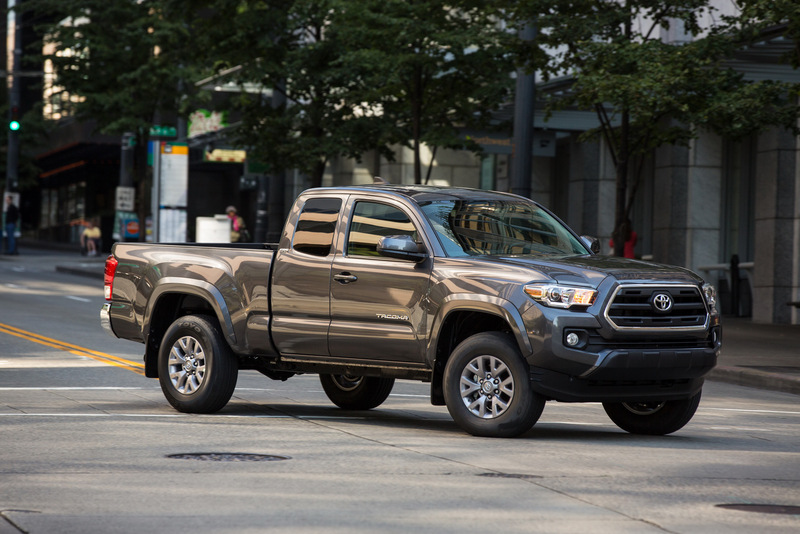 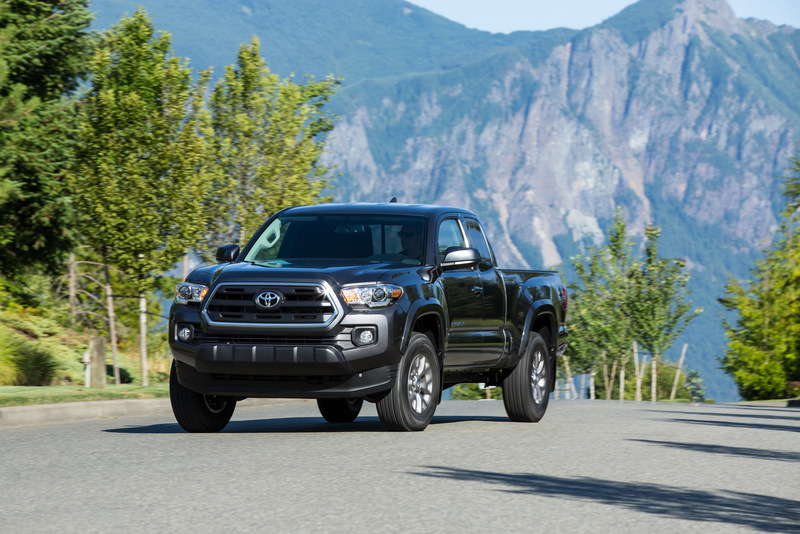 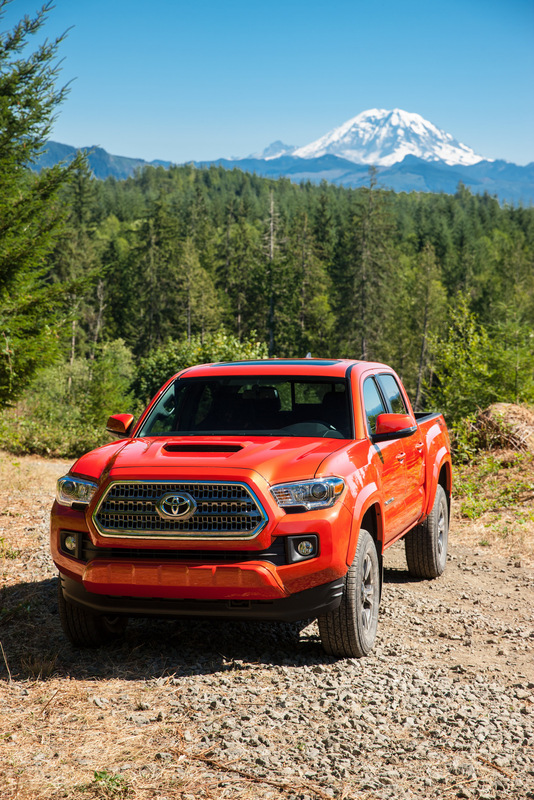 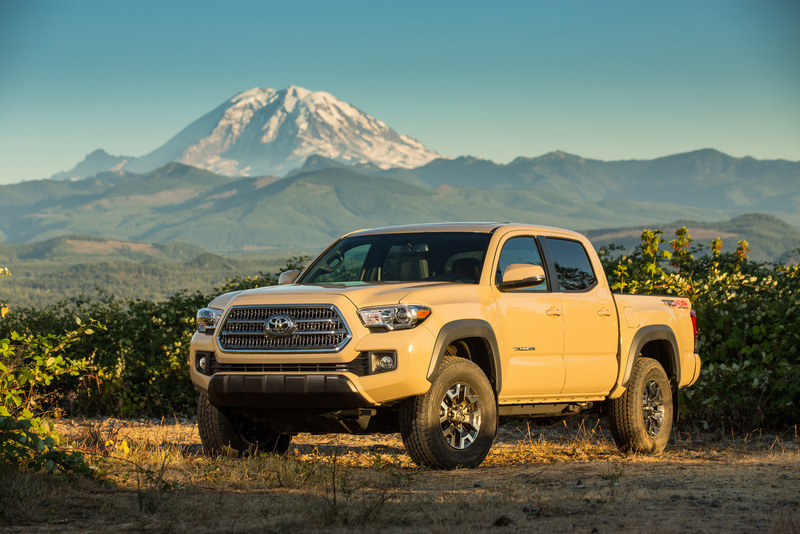 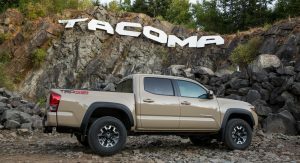 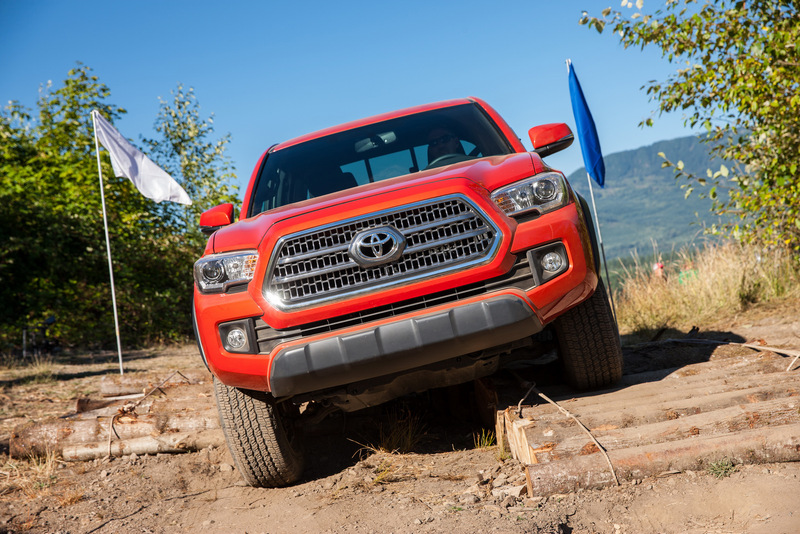 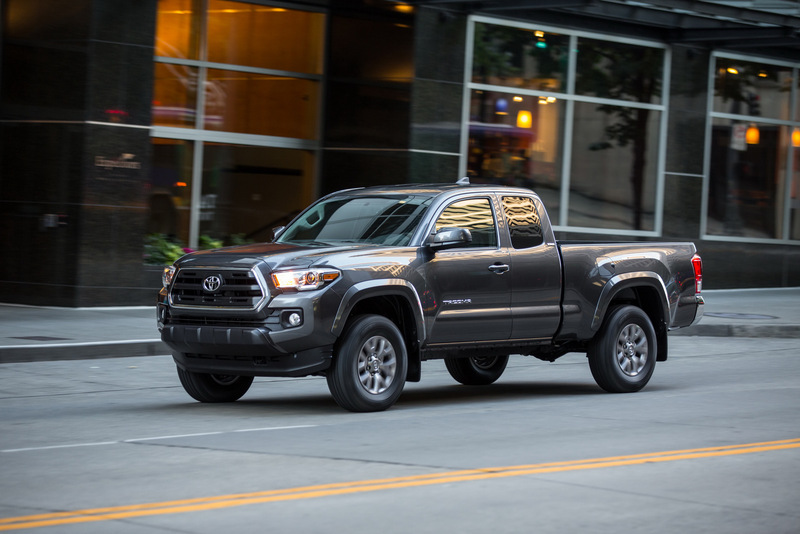 The base 2016 Tacoma 4×2 SR Access Cab starts from $23,300 equipped with the 2.7-liter four-cylinder engine and six-speed automatic transmission. 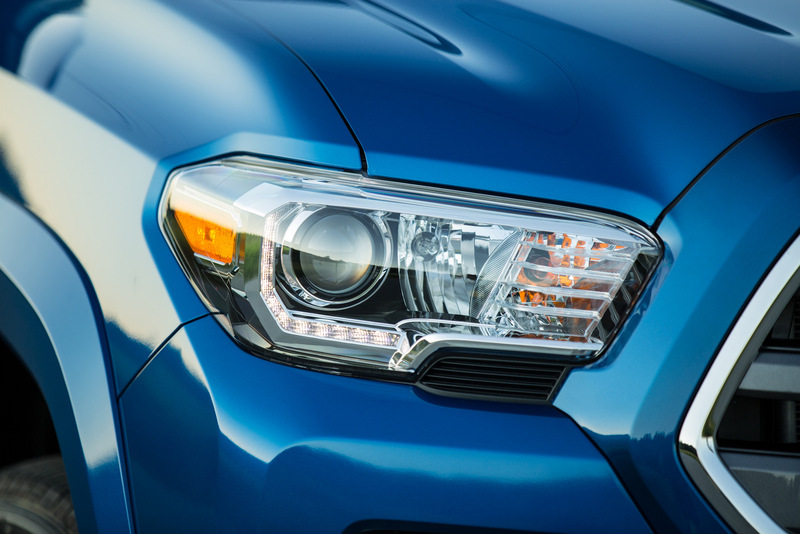 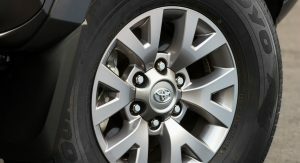 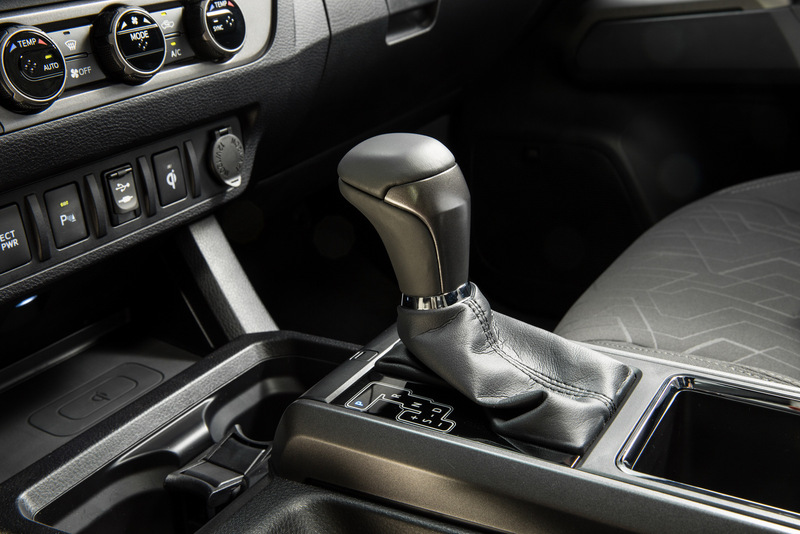 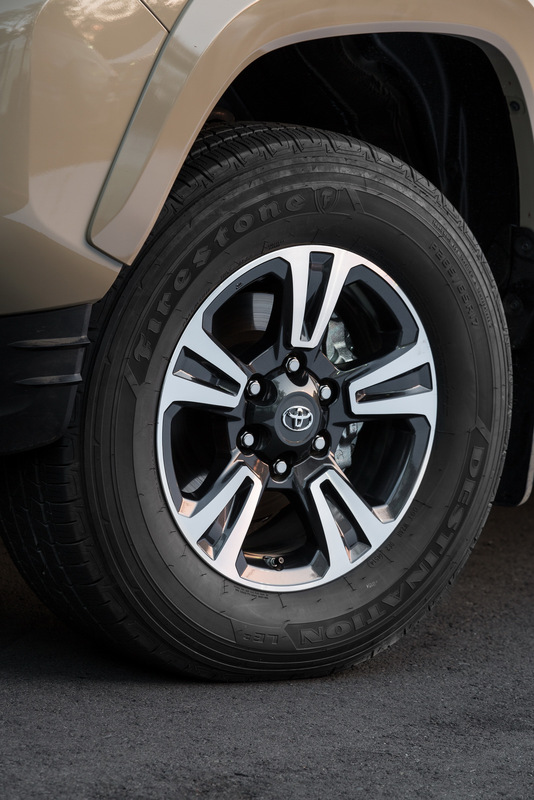 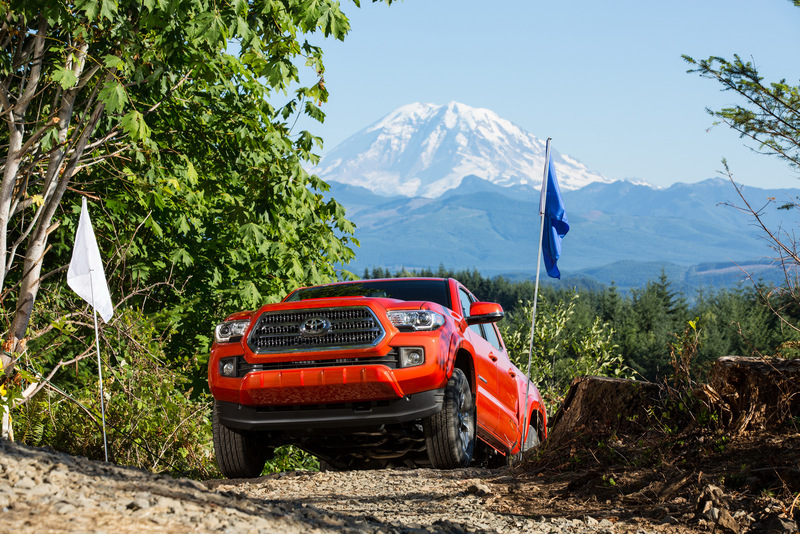 All-wheel drive versions start from $24,825 for the 2016 Tacoma SR with the four-cylinder engine and a five-speed manual transmission. 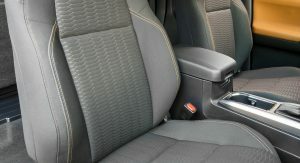 Prices do not include the delivery, processing, and handling (DPH) fee of $900. 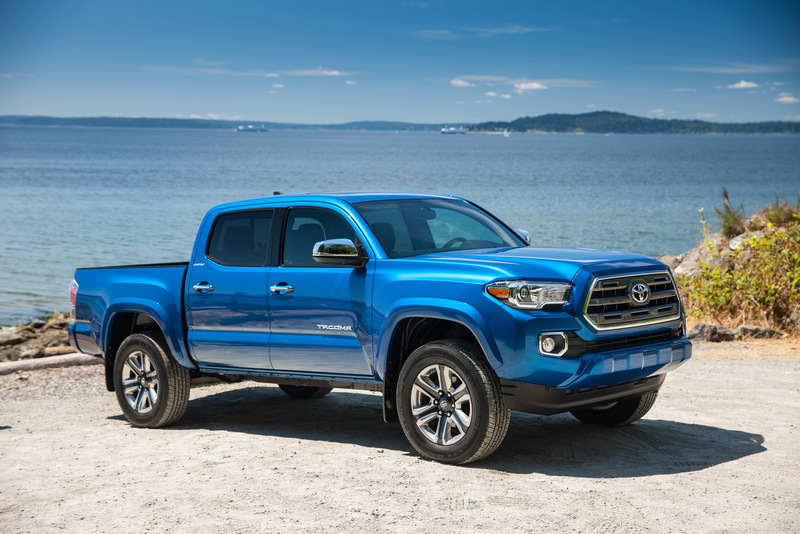 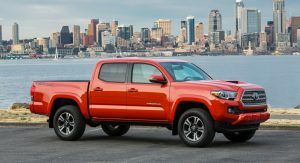 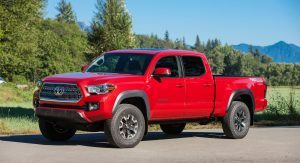 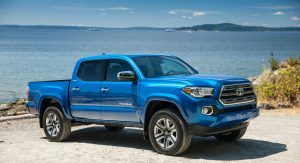 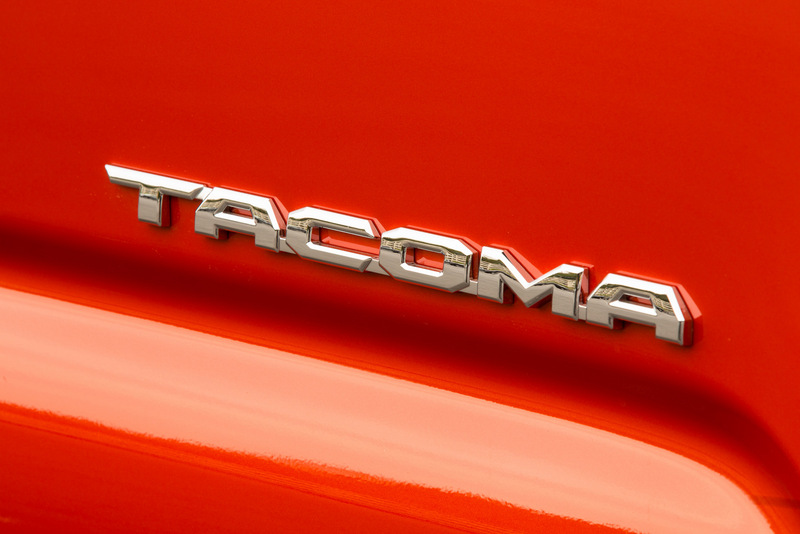 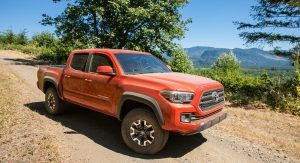 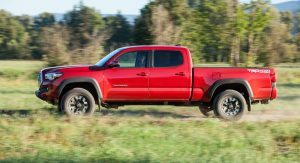 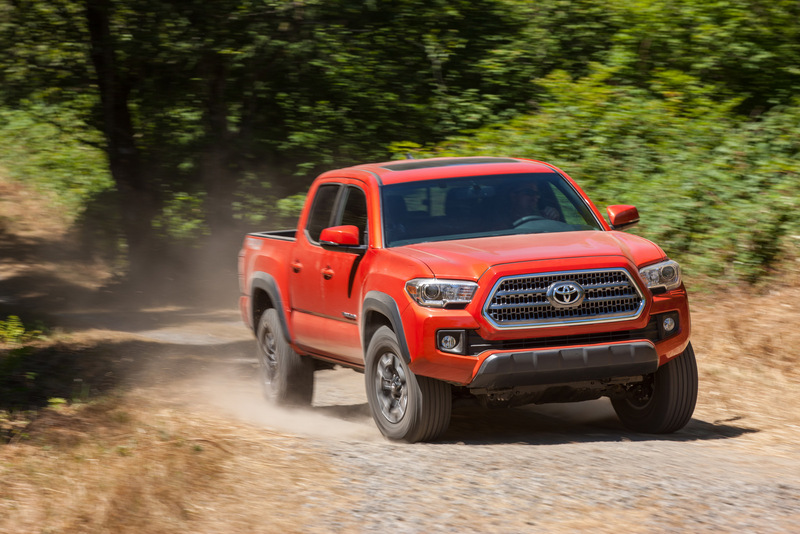 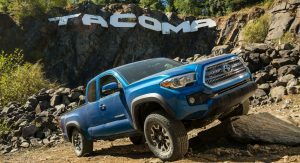 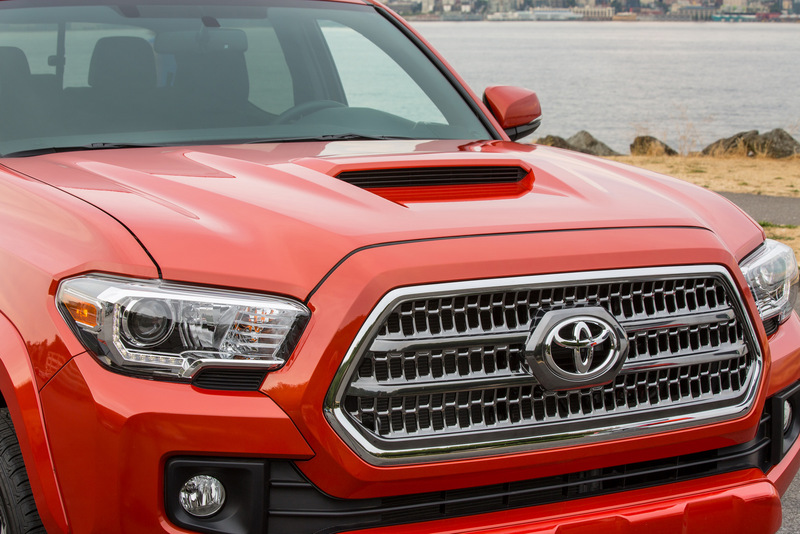 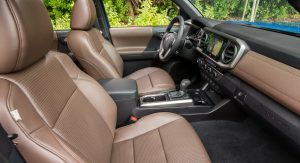 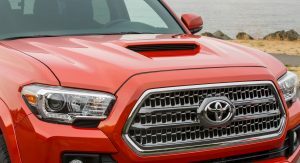 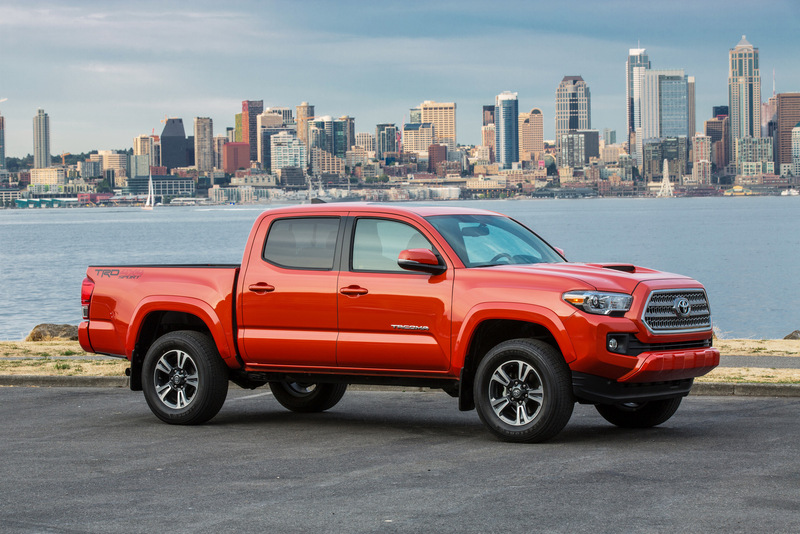 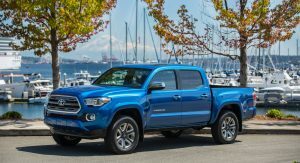 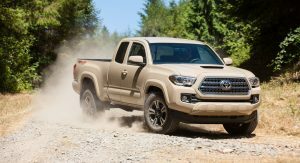 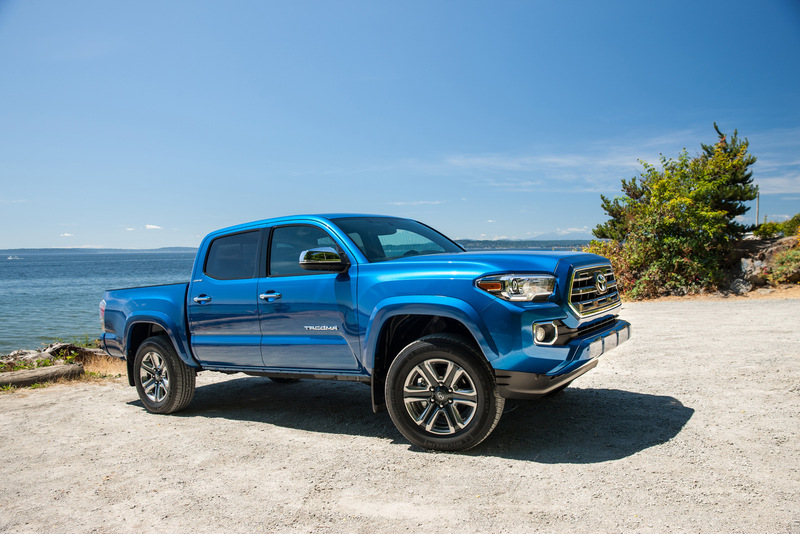 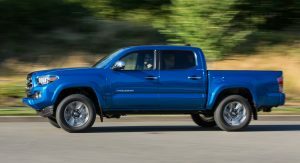 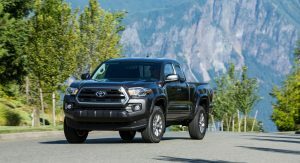 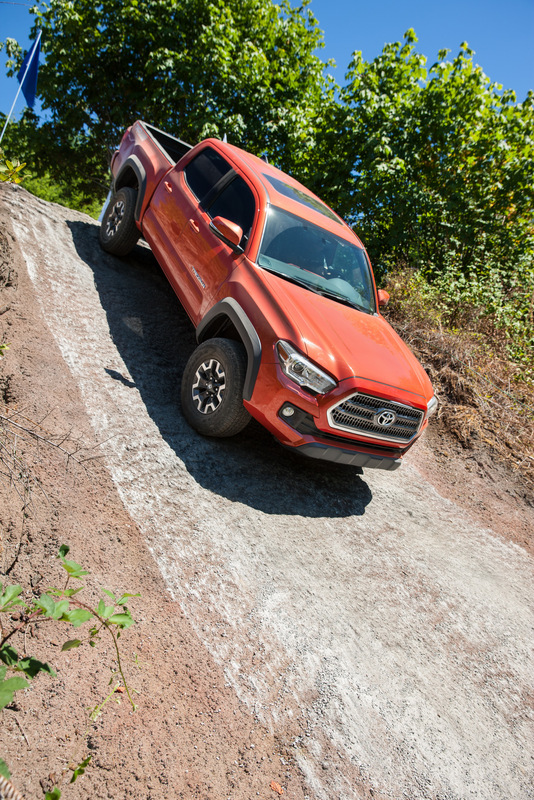 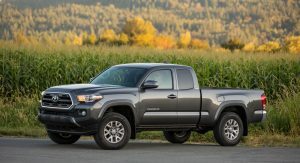 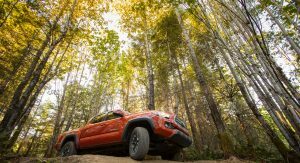 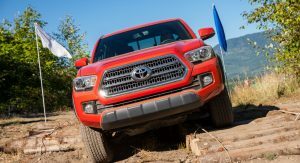 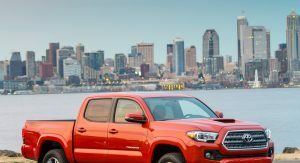 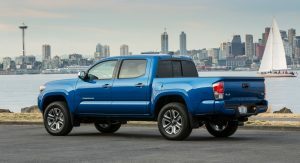 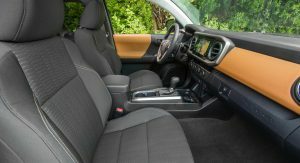 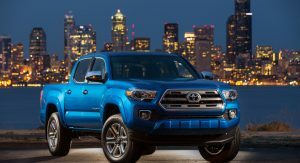 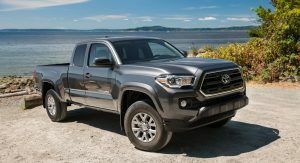 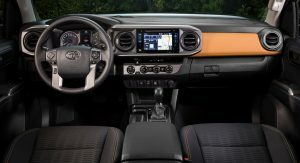 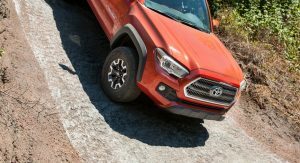 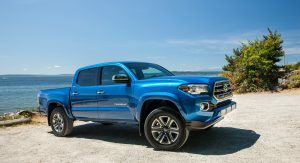 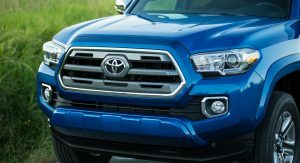 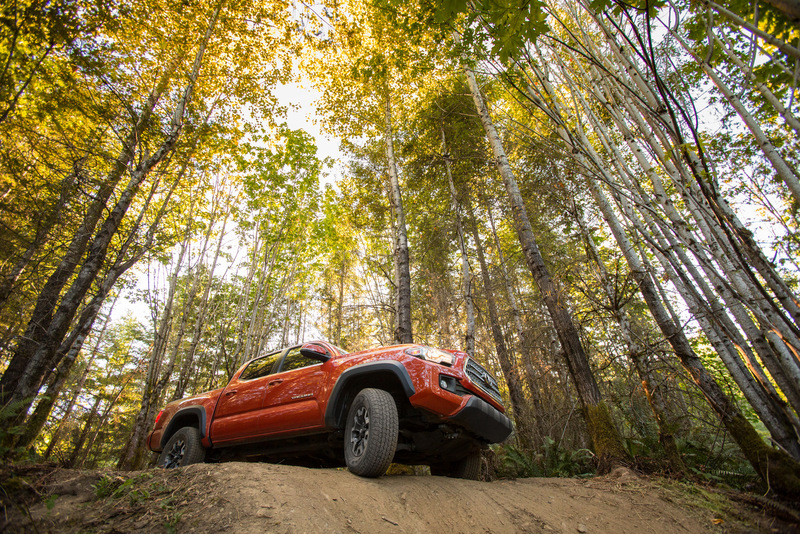 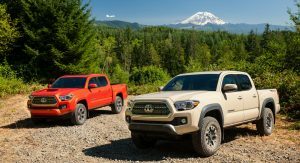 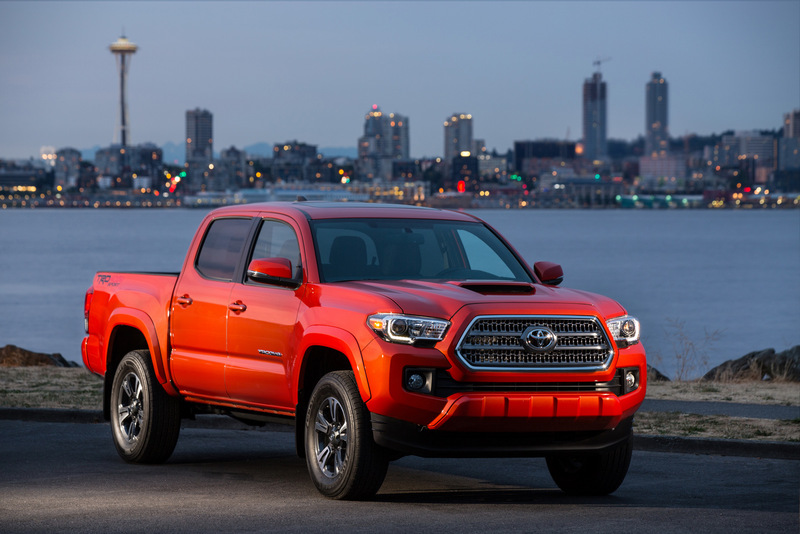 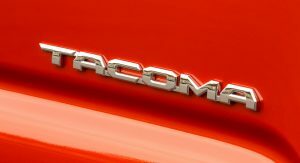 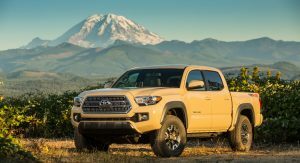 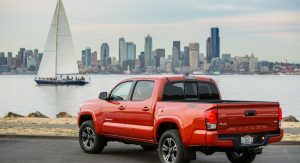 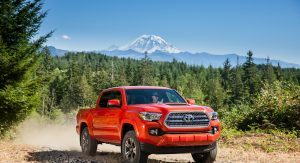 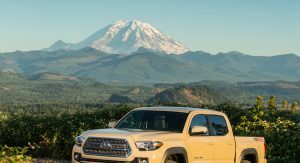 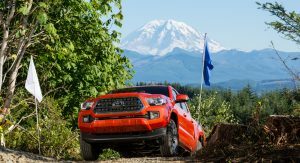 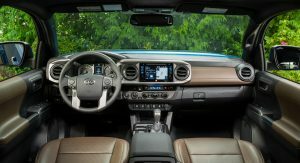 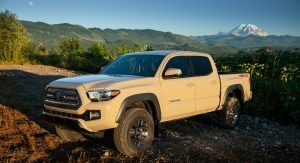 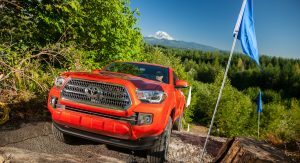 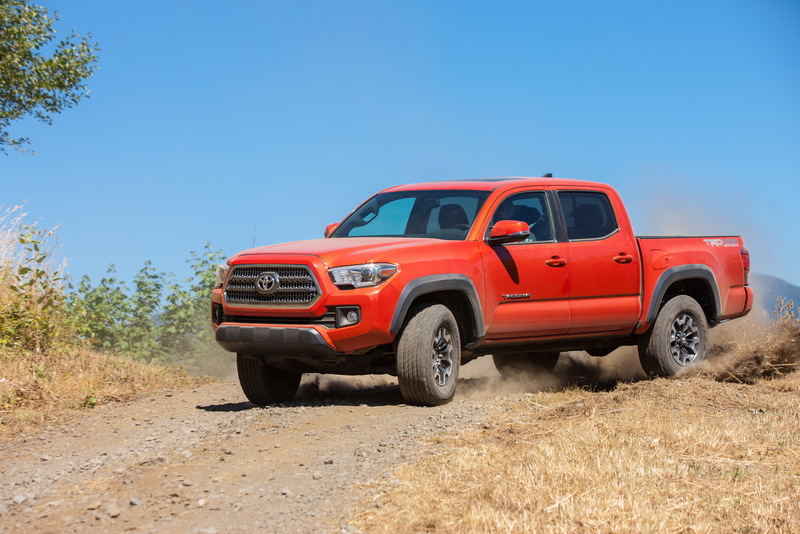 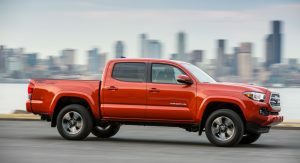 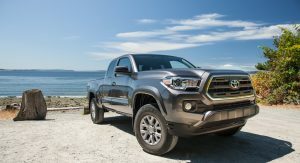 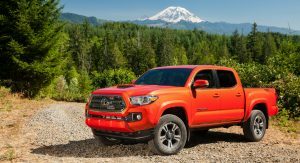 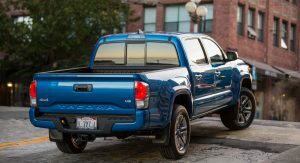 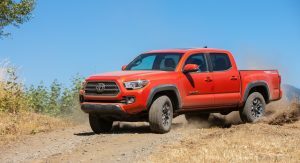 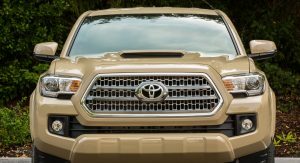 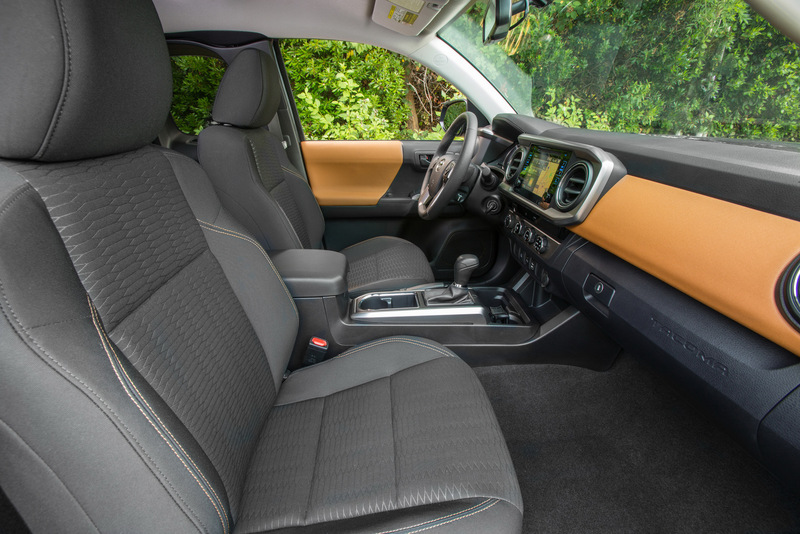 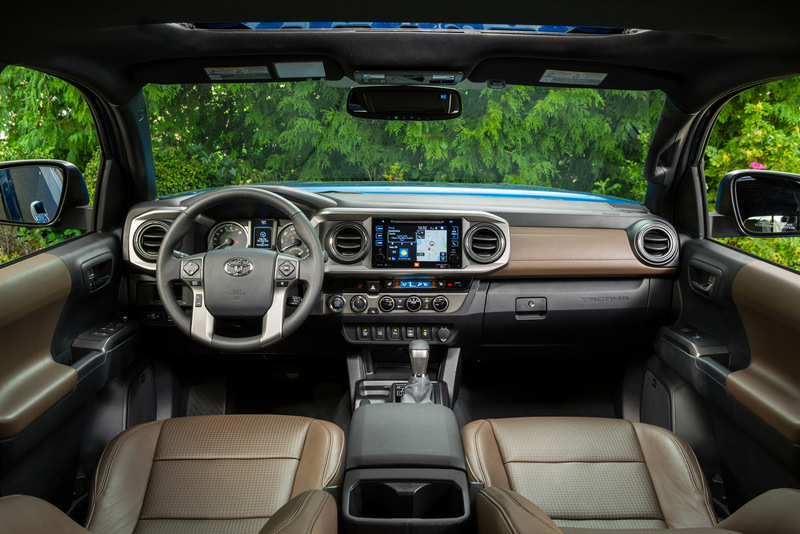 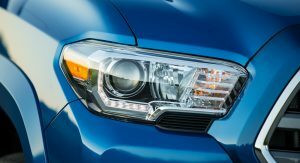 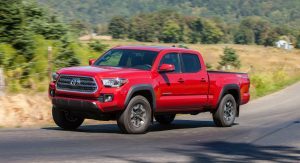 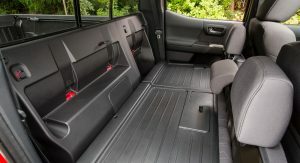 The new Tacoma is offered with two engines, a 2.7-liter four-cylinder rated at 159hp and 180lb-ft (244Nm) of torque and a 3.5-liter V6 delivering 278hp and 265lb-ft (359Nm) of torque. 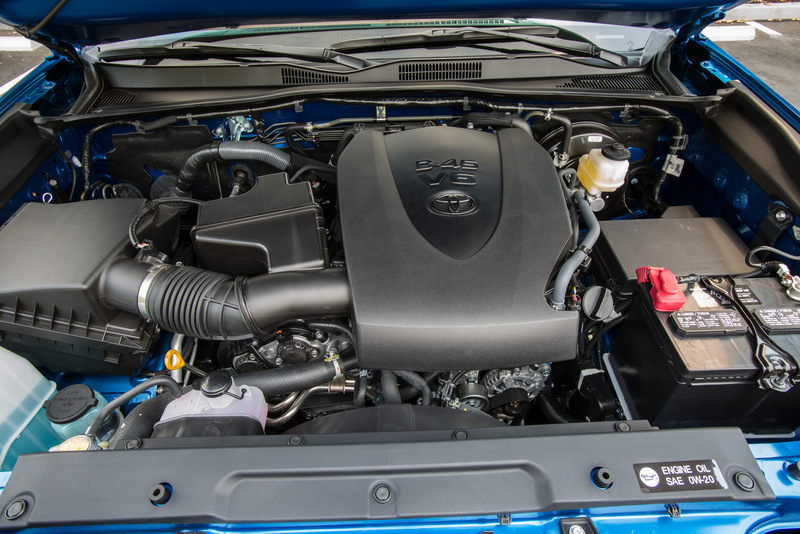 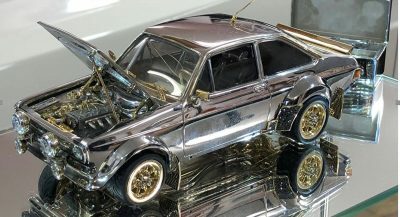 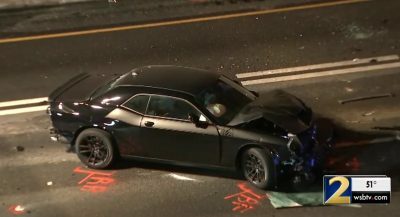 Both engines will be mated to a new six-speed automatic transmission. 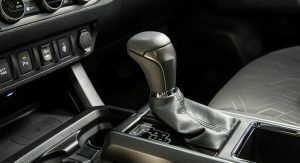 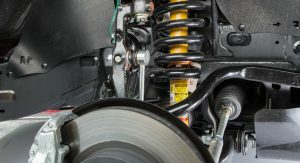 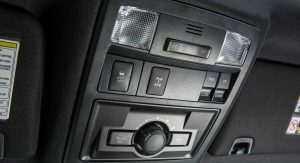 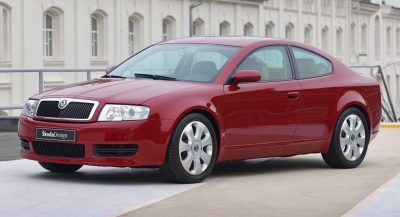 The V6 can also be mated to a new six-speed manual transmission, while the four-cylinder is also offered with a five-speed manual. 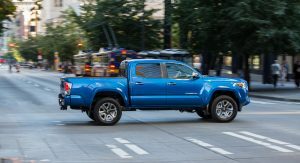 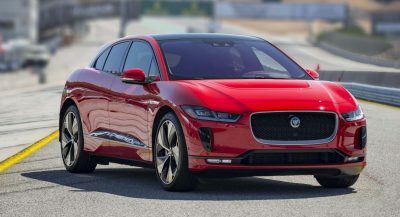 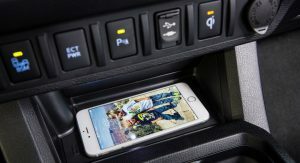 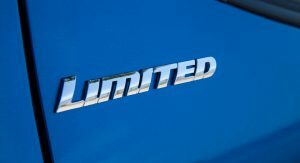 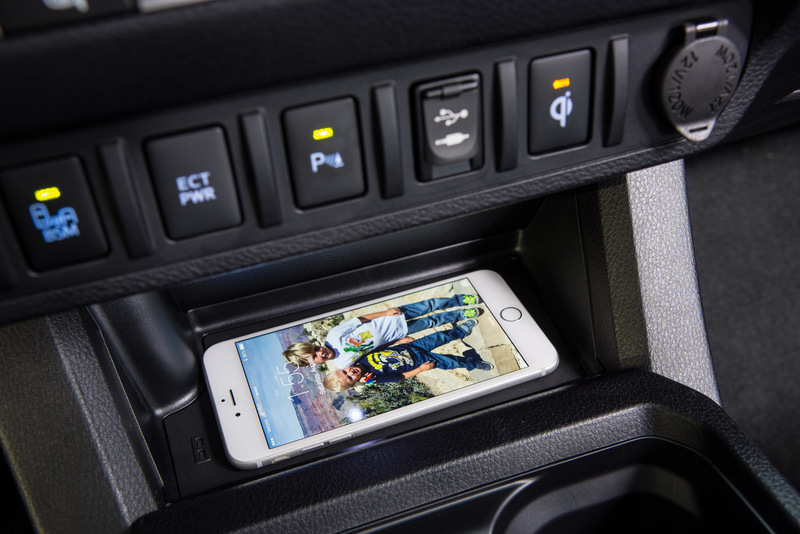 EPA estimated fuel economy ratings for the two-wheel drive four-cylinder model with automatic transmission are 19 mpg city, 23 mpg highway and 21 mpg combined. 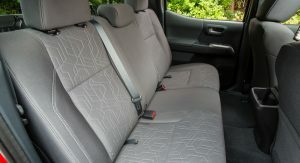 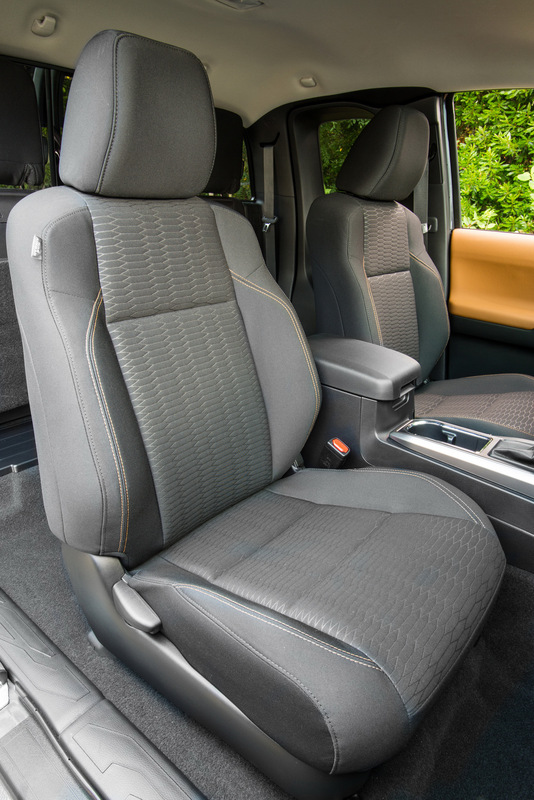 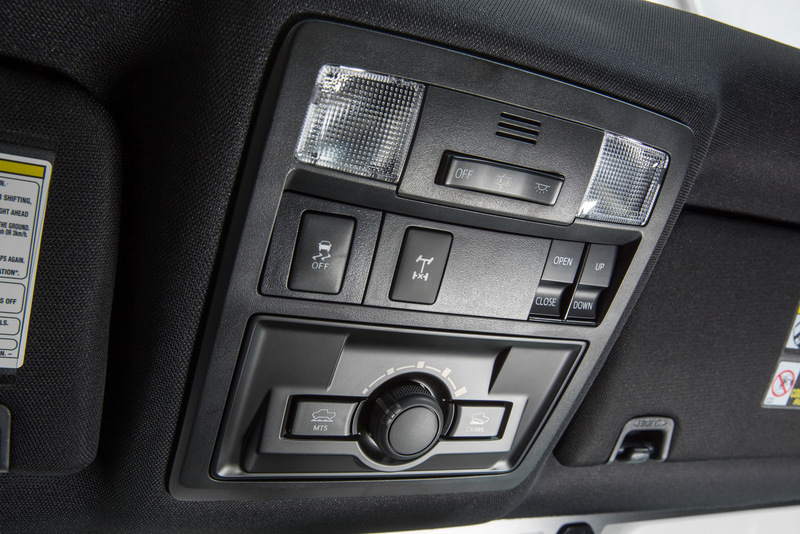 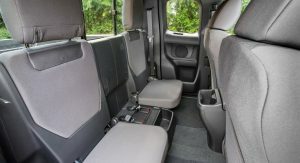 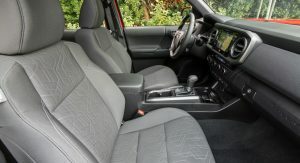 Estimated fuel efficiency for the 4×4 with a manual transmission is 19/21/20 and 19/22/20 for the automatic. 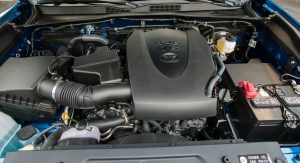 The Atkinson cycle V6 engine with VVT-iW (Variable Valve Timing with Intelligent Wider Intake) featuring both direct and port fuel injection offers an increase of 42hp over the previous V6. 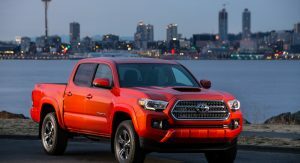 Estimated city/highway/combined fuel economy ratings for the two-wheel drive V6 model with automatic transmission are 19 mpg city/24 mpg highway/21 mpg combined. 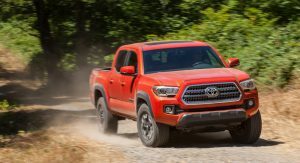 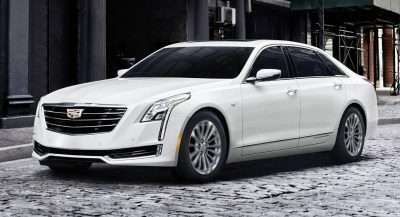 All-wheel drive V6 models with manual transmission return 17/21/19 (18/23/20 with the automatic). 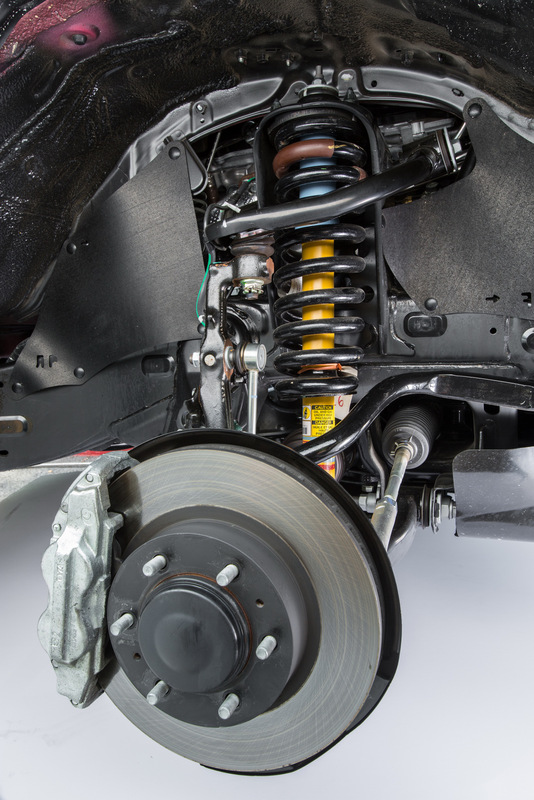 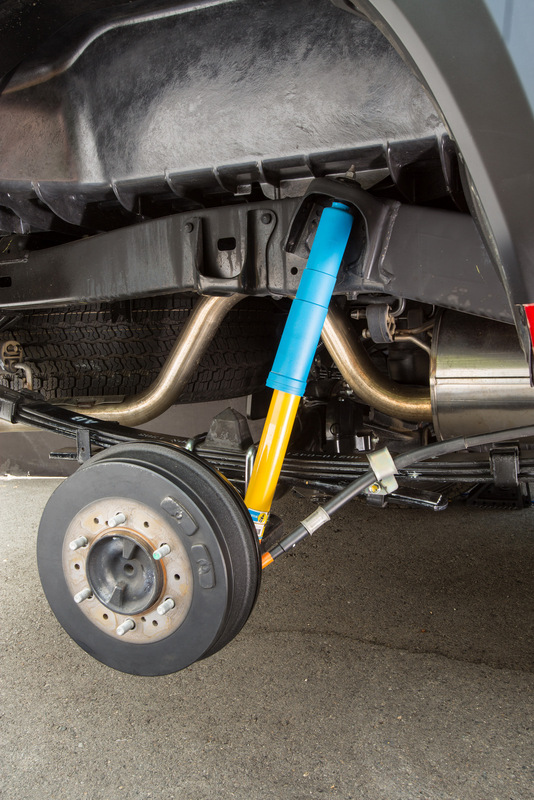 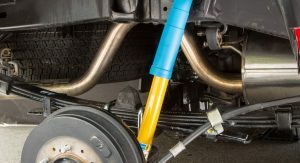 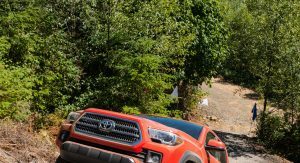 When equipped with the V6 Tow Package, the new Tacoma can tow up to 6,800 lbs (3,084 kg), an increase of 300 lbs (136 kg) over the previous V6. 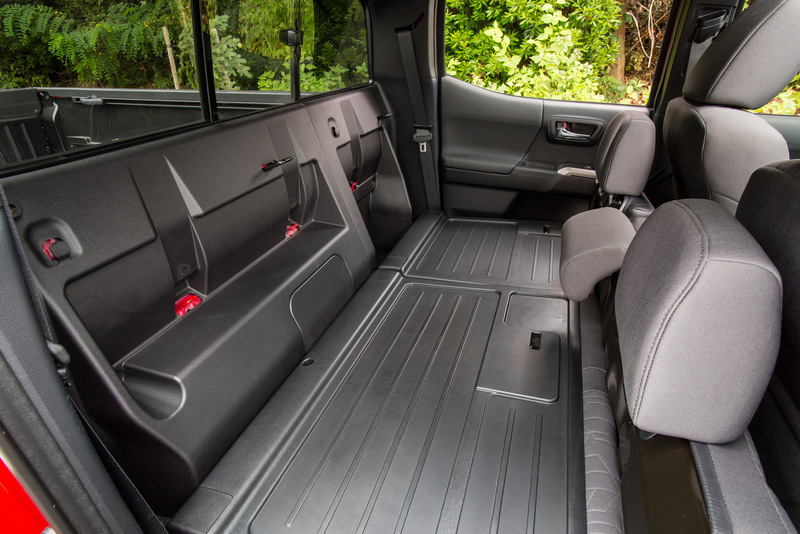 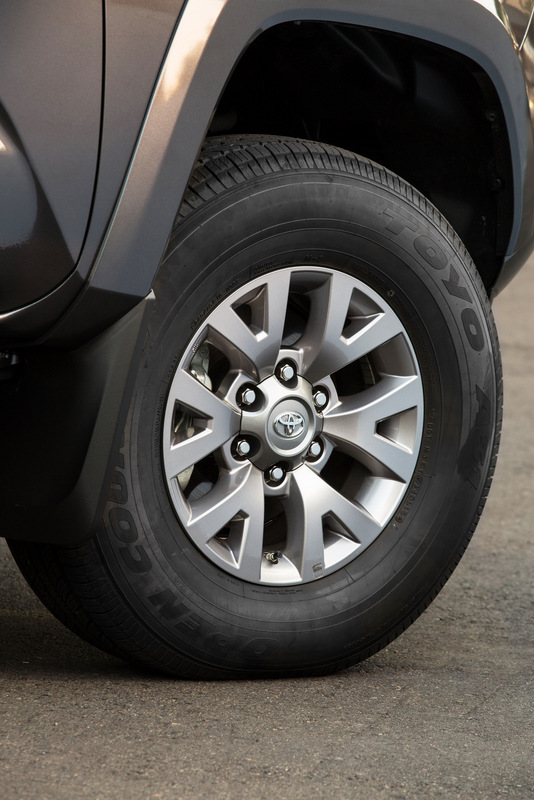 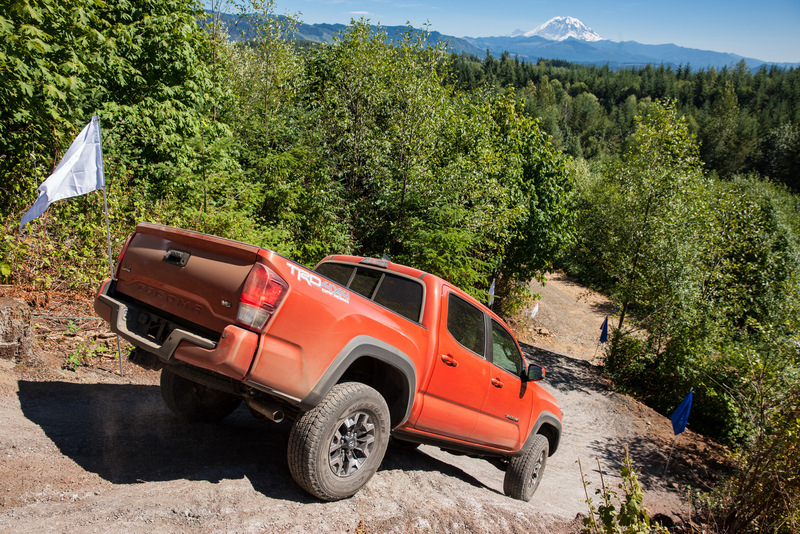 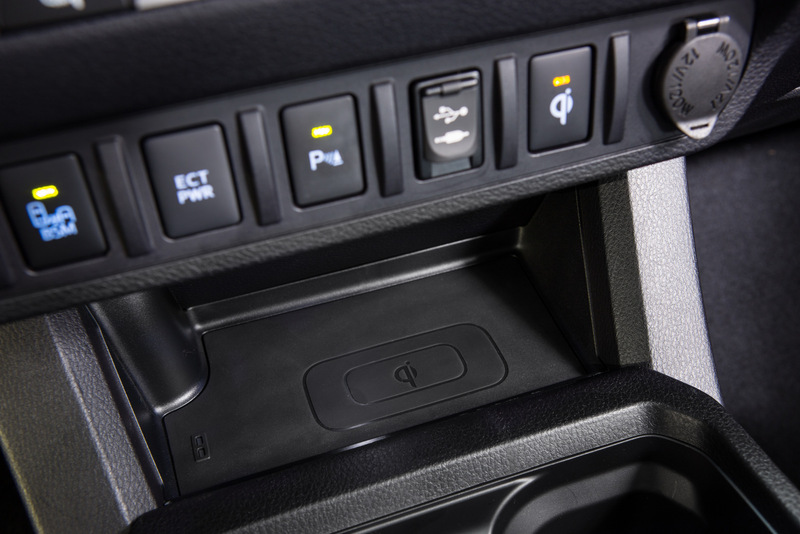 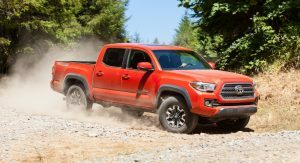 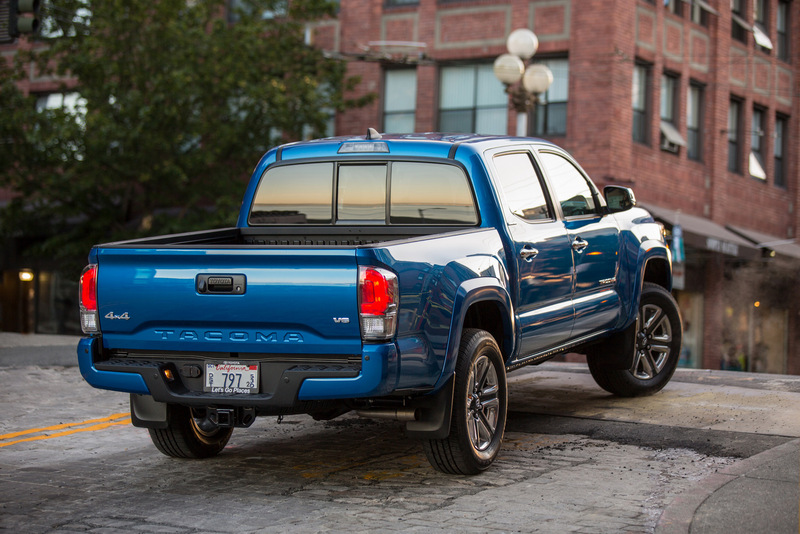 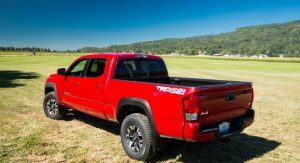 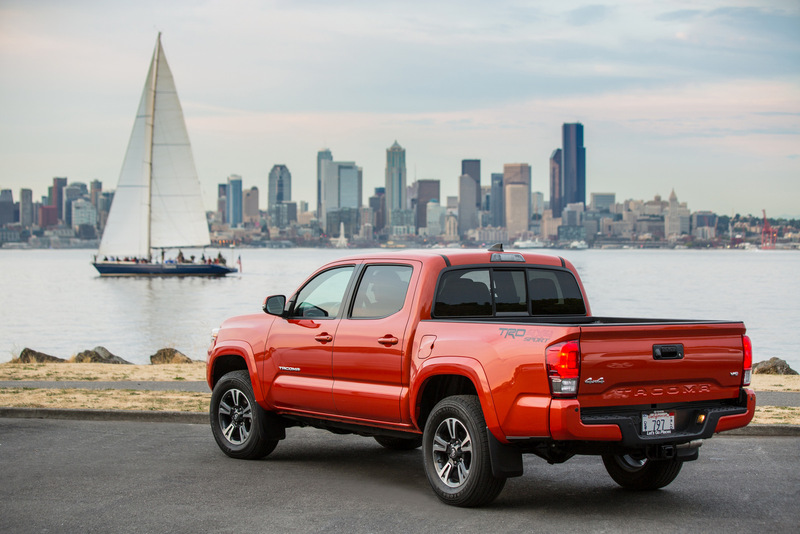 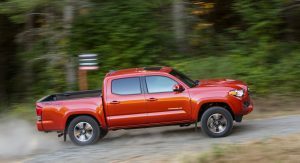 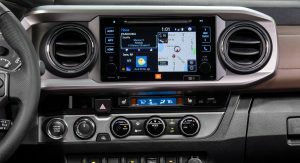 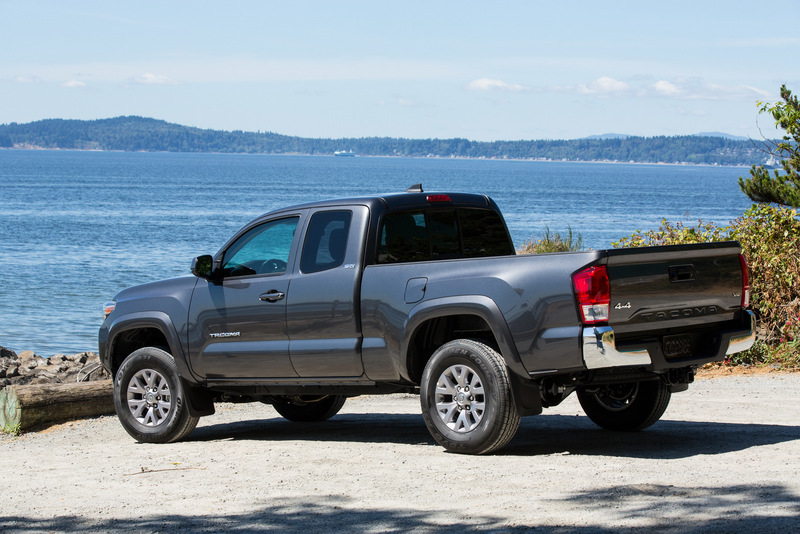 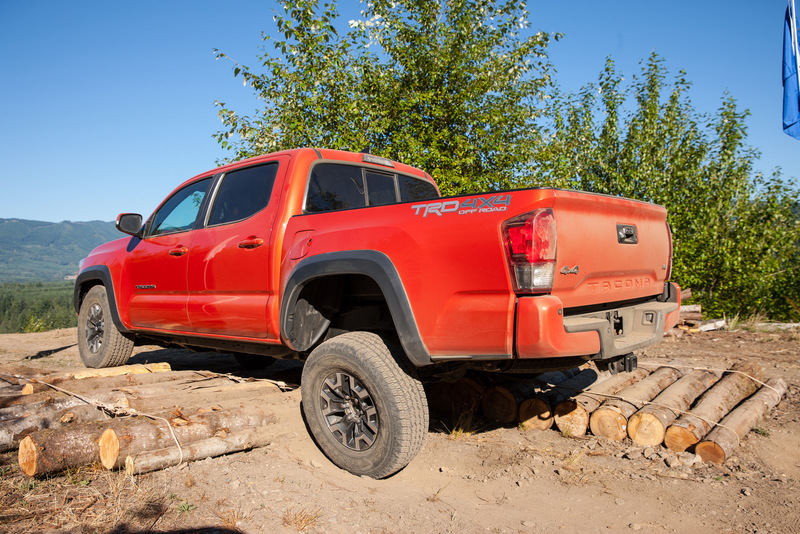 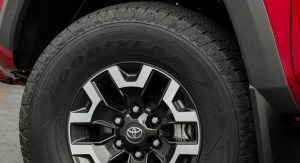 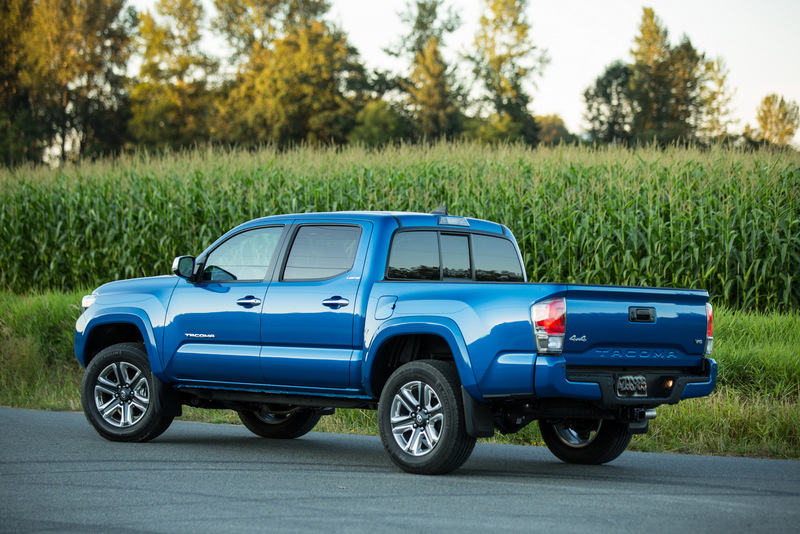 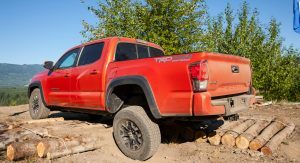 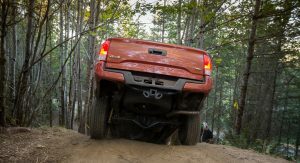 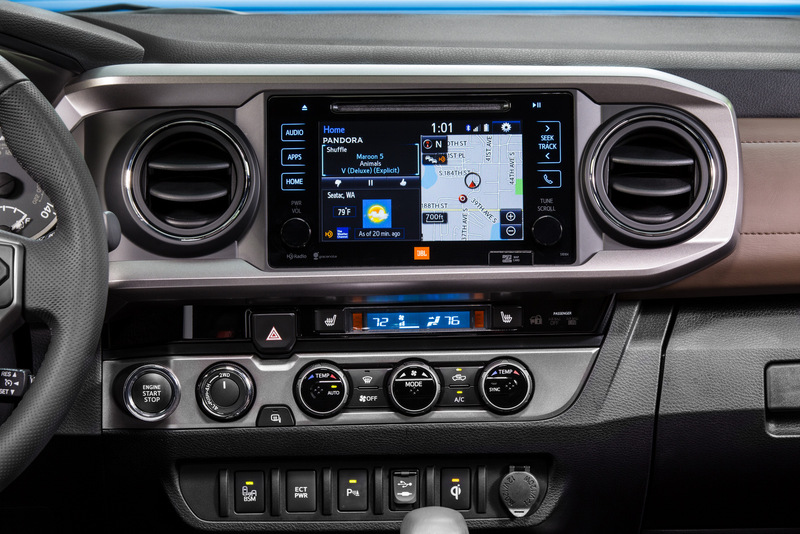 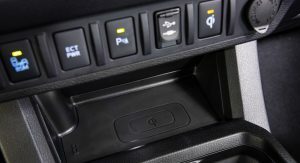 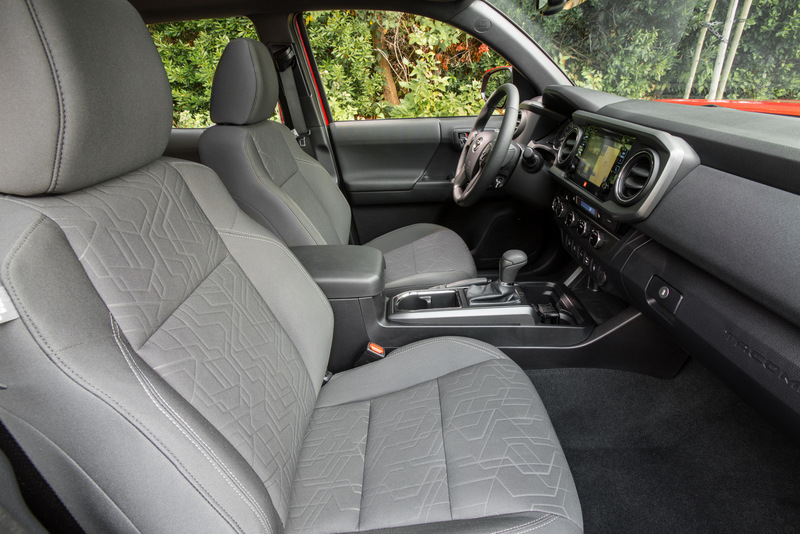 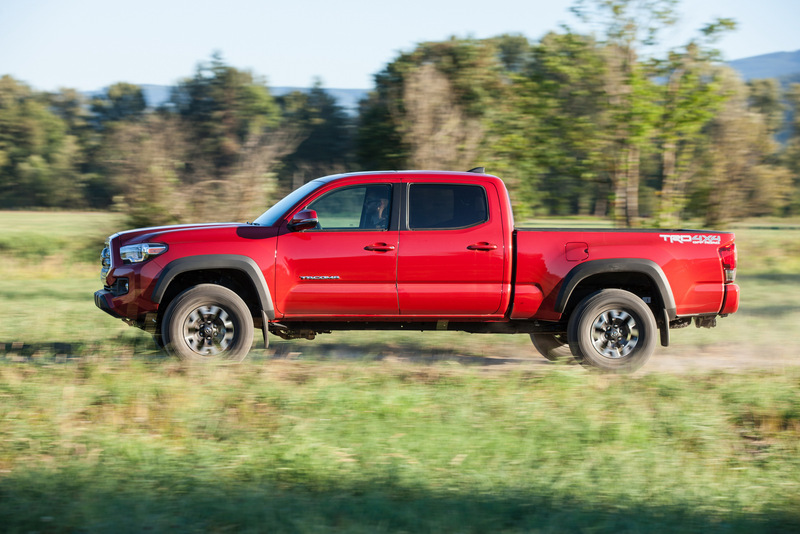 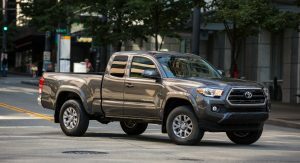 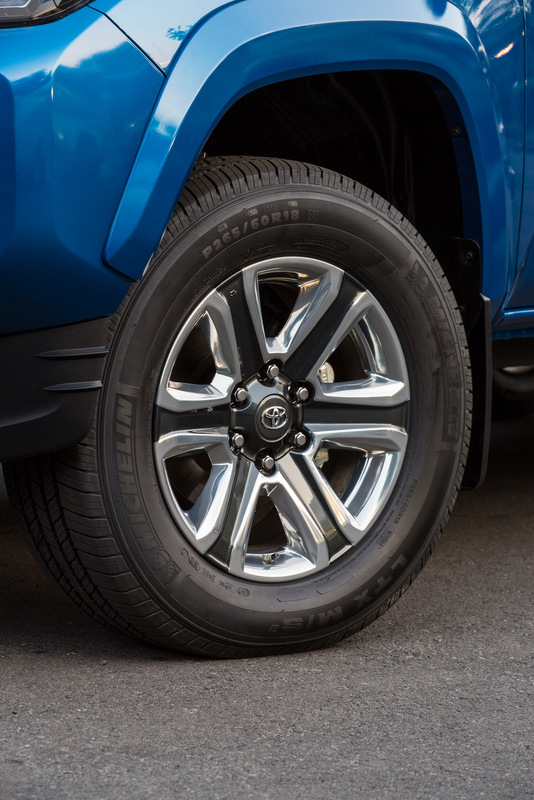 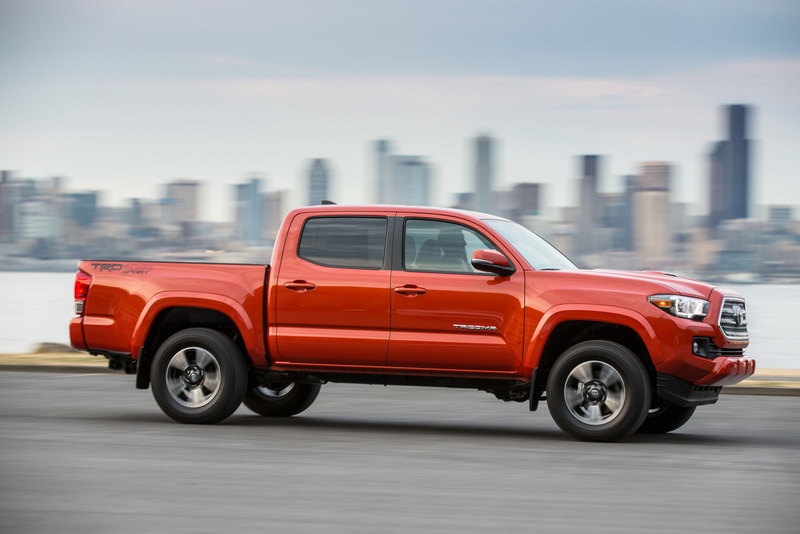 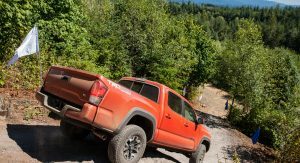 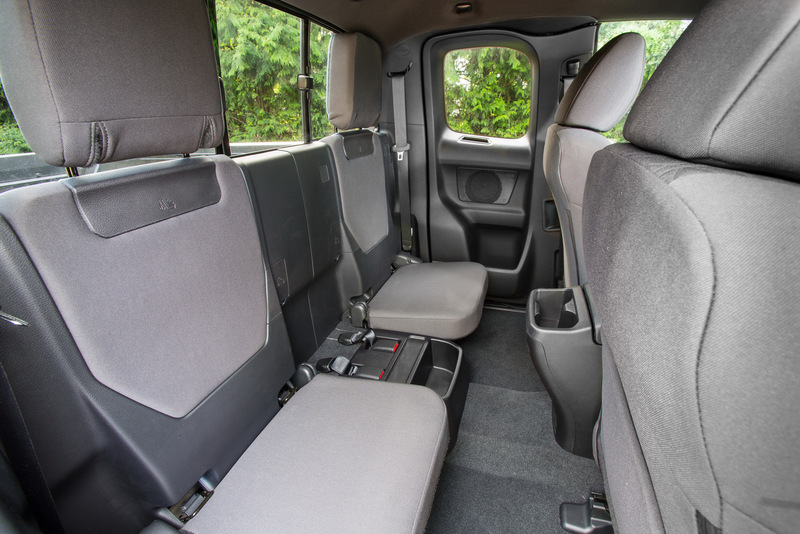 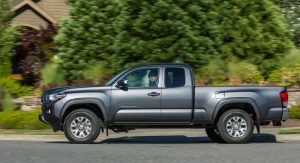 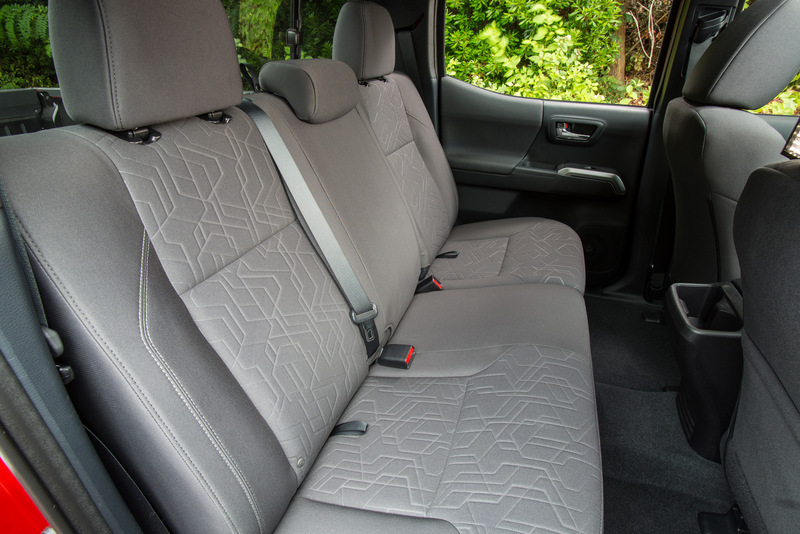 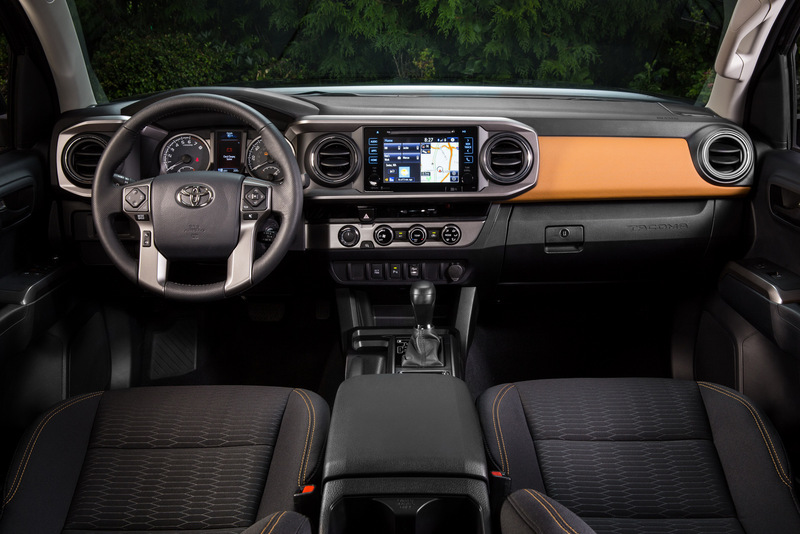 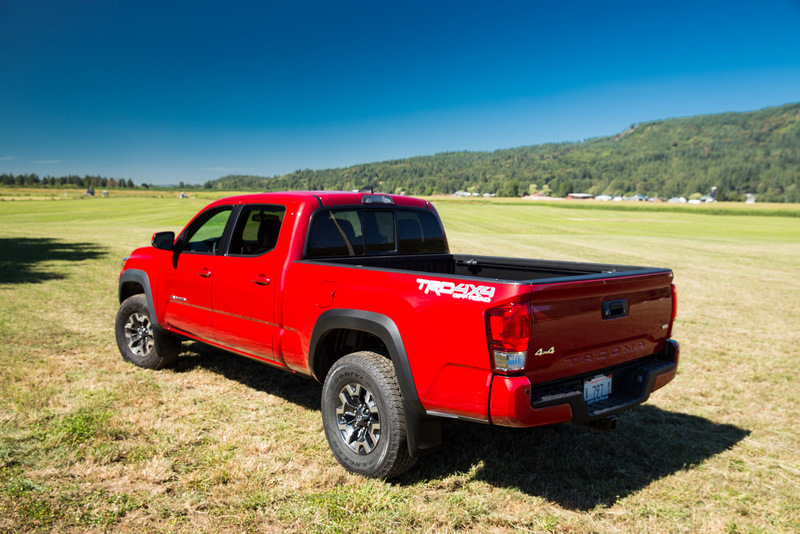 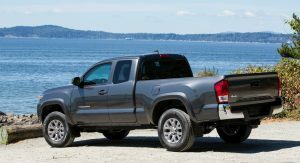 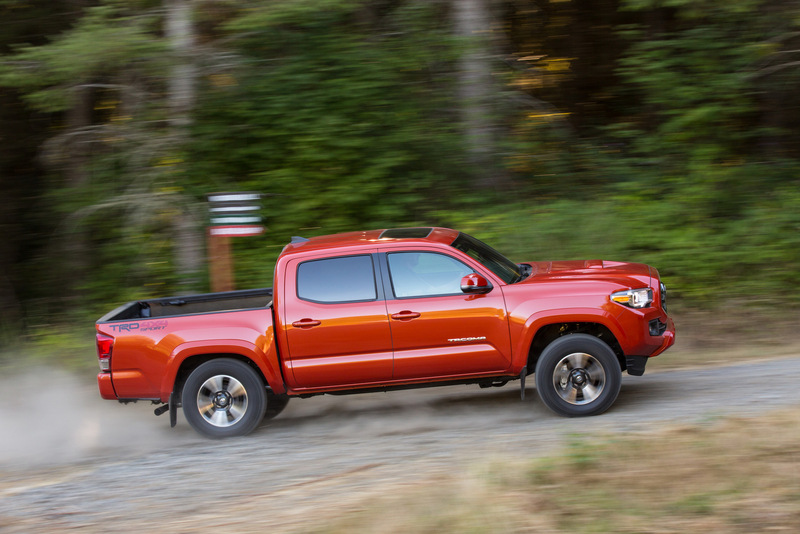 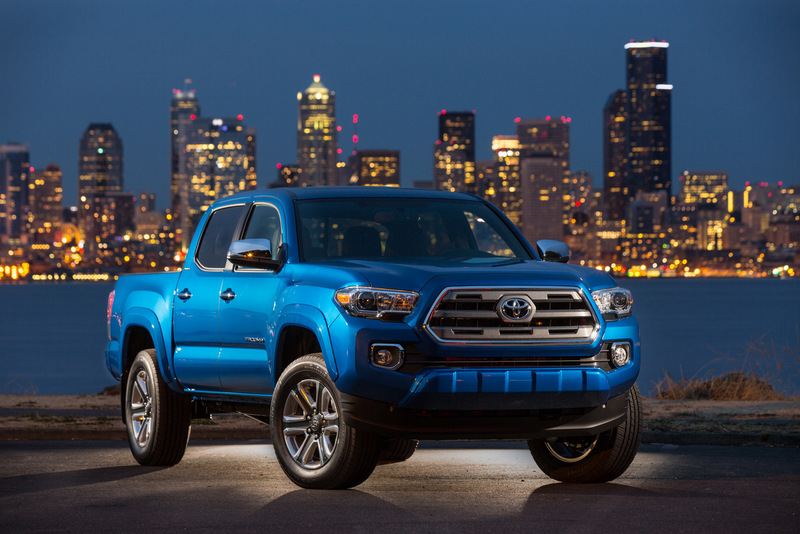 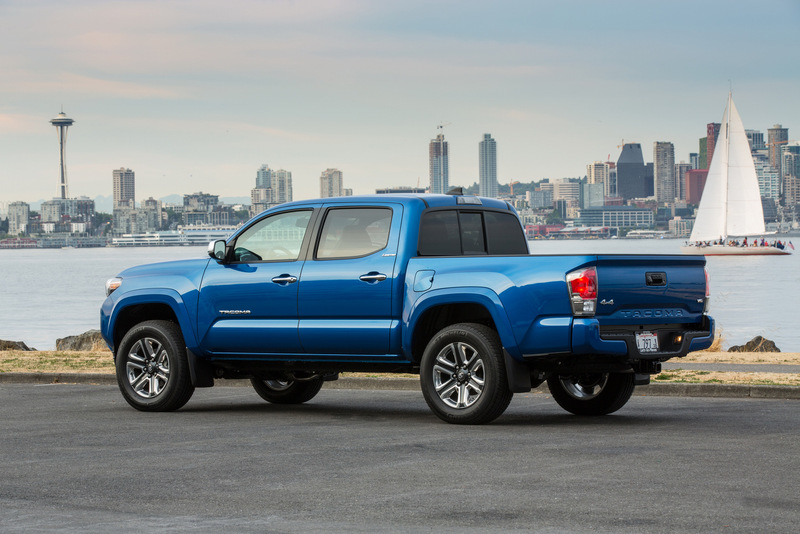 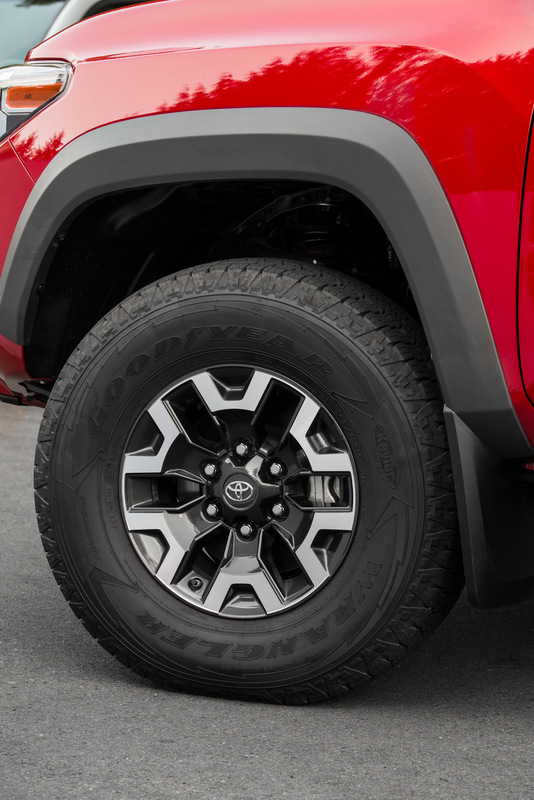 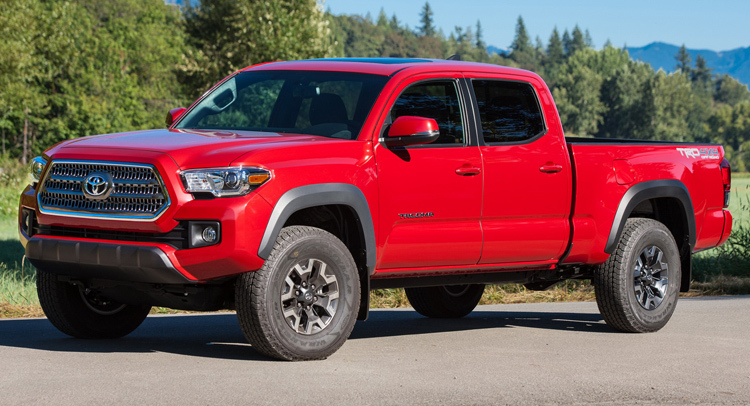 The 2016 Toyota Tacoma will be available in 29 configurations in two cab types – the extended Access Cab and four-door Double Cab, each available in both 4×2 and 4×4 configurations. 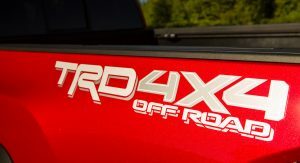 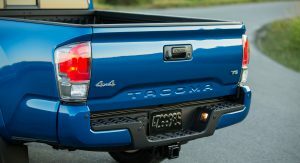 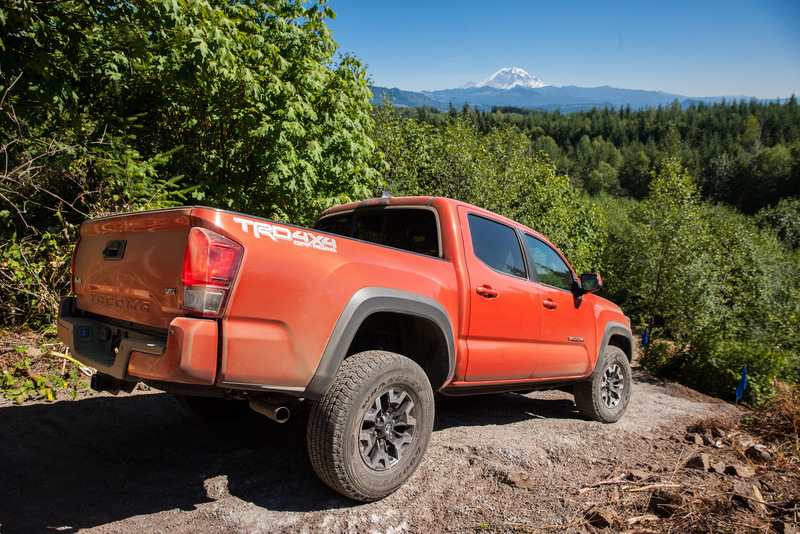 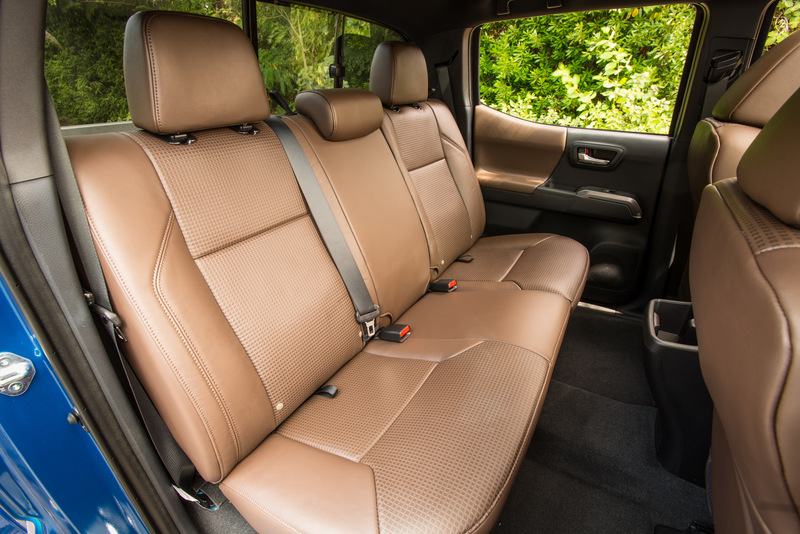 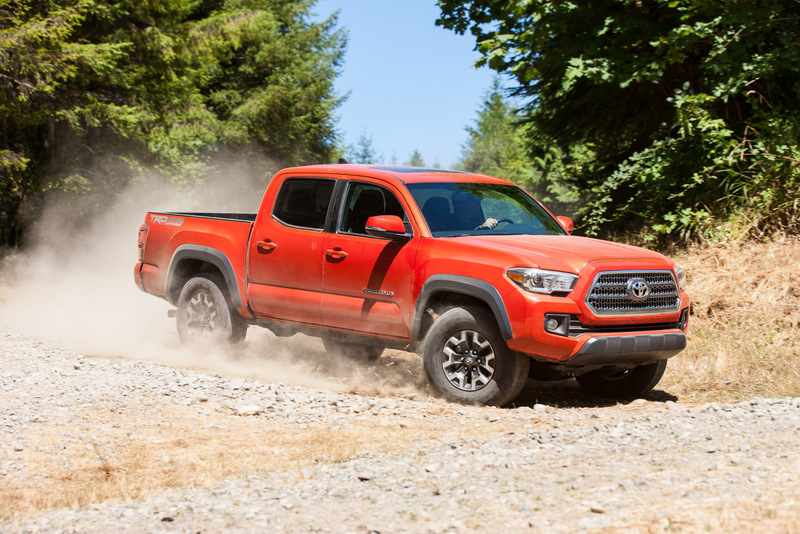 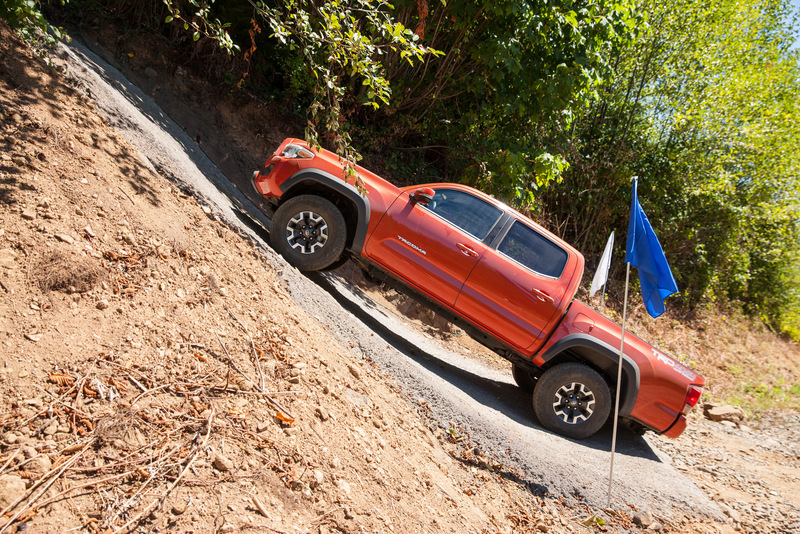 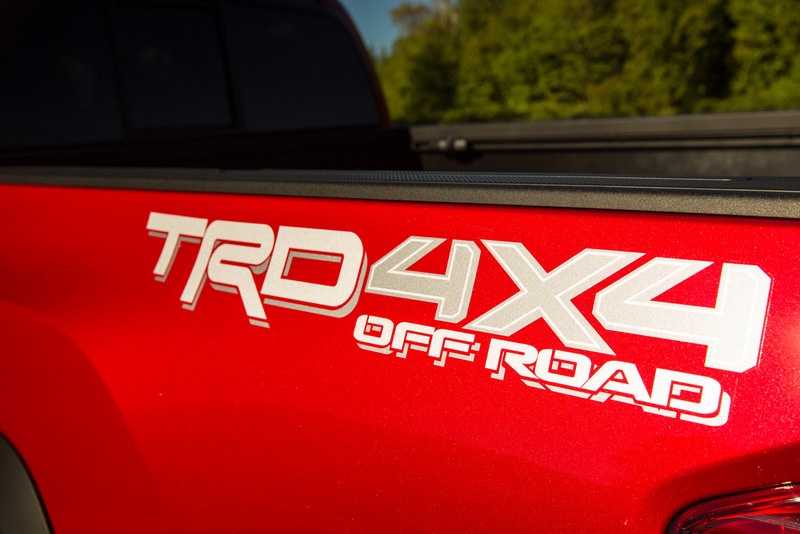 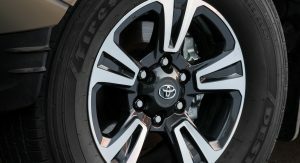 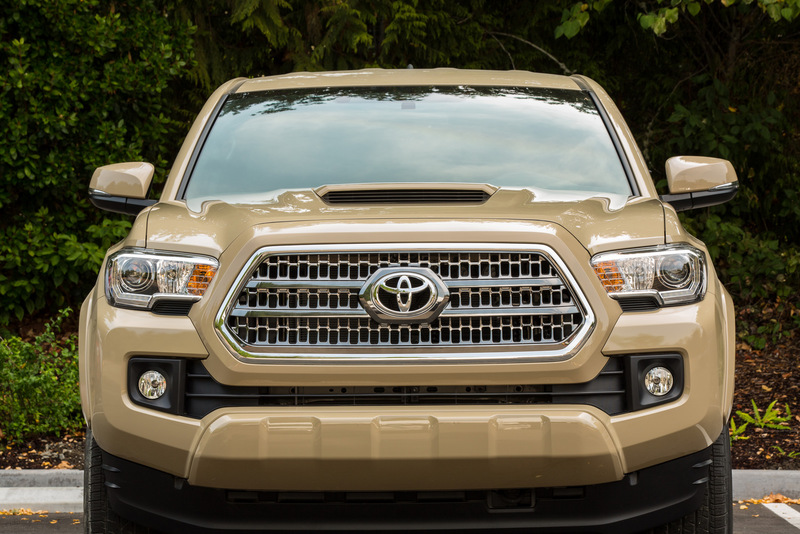 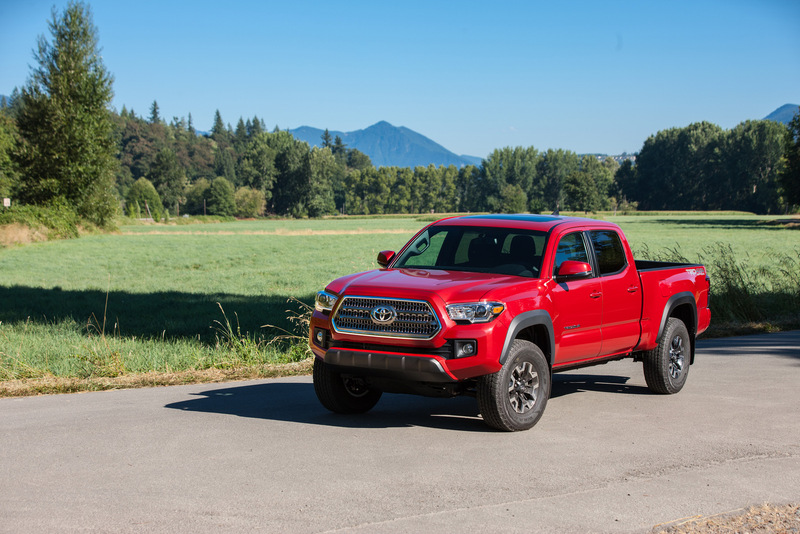 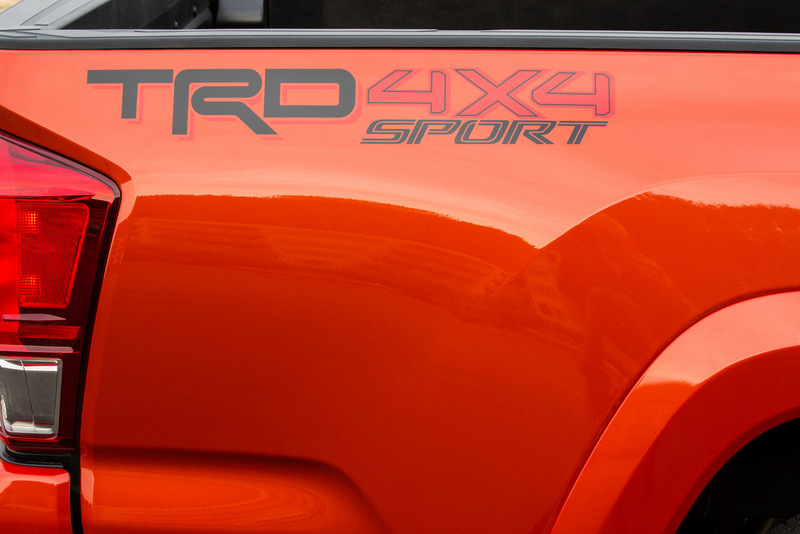 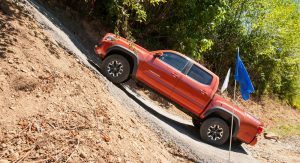 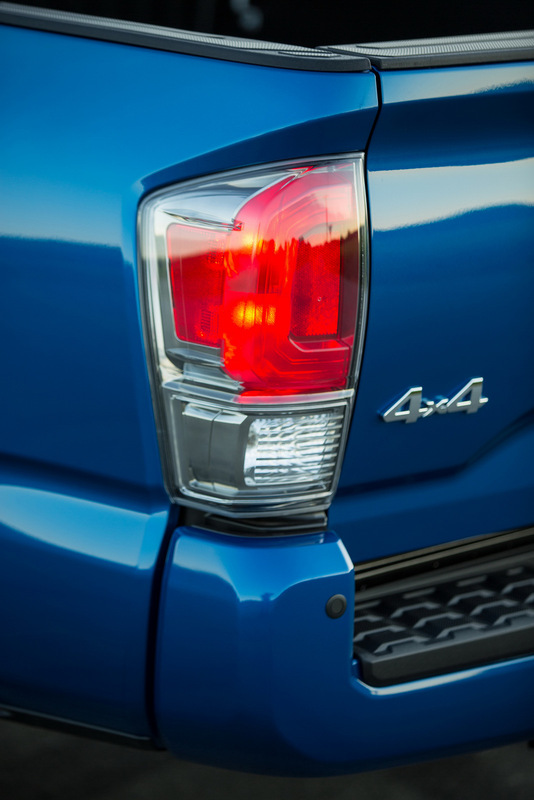 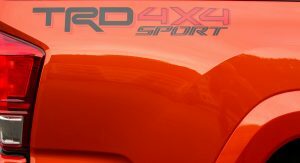 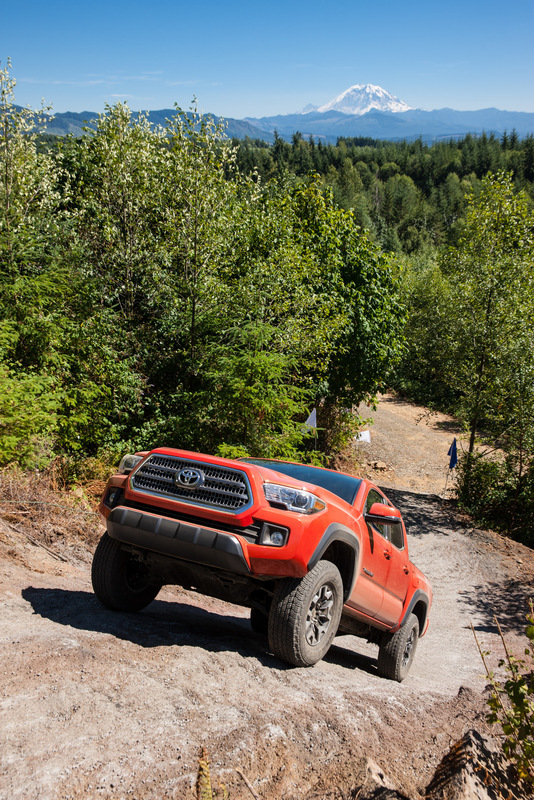 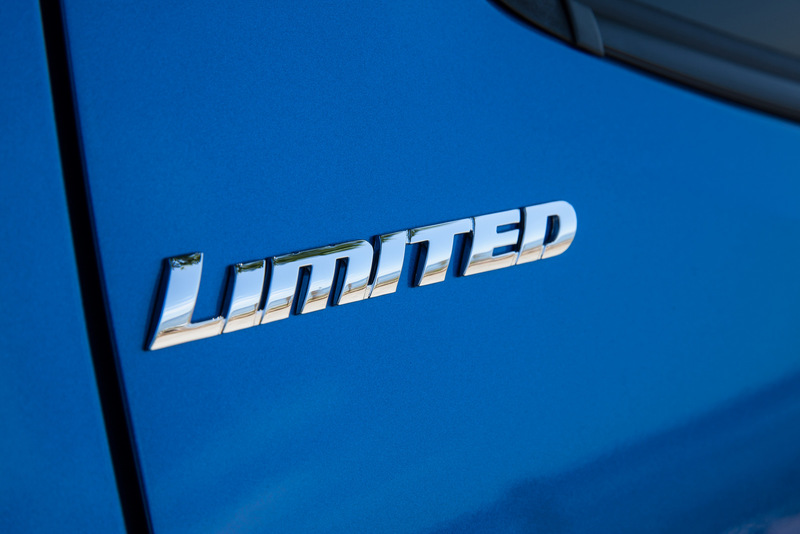 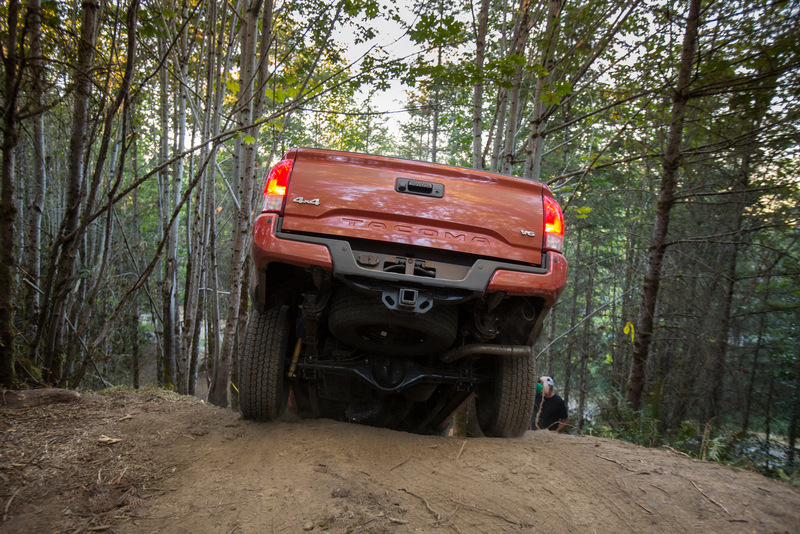 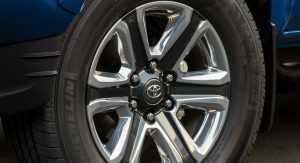 The truck is offered with five model grades: SR, SR5, TRD Sport, TRD Off-Road and the range-topping Limited.